A lake – isn’t that just a place where you fish and swim? 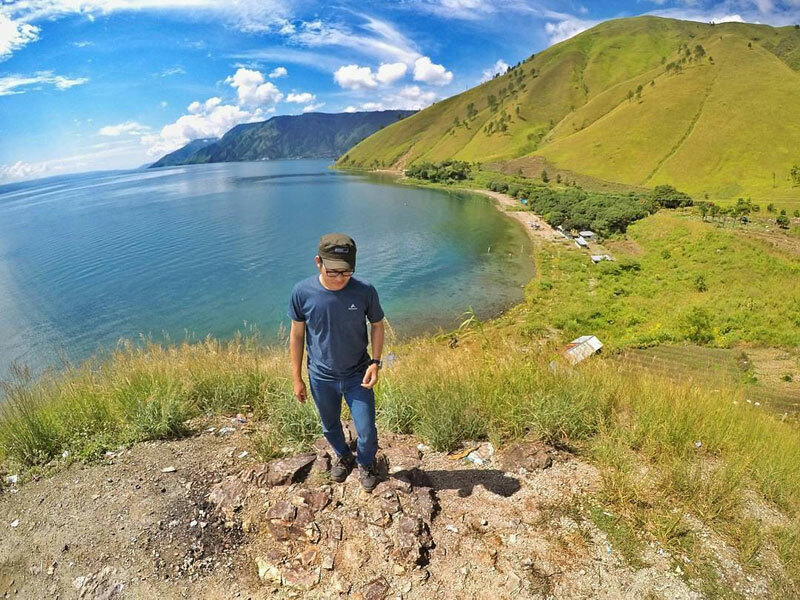 Well, hold that thought, because Lake Toba is definitely not just any lake, but one that sits in the caldera of a supervolcano! And that’s not the only reason that makes it special. 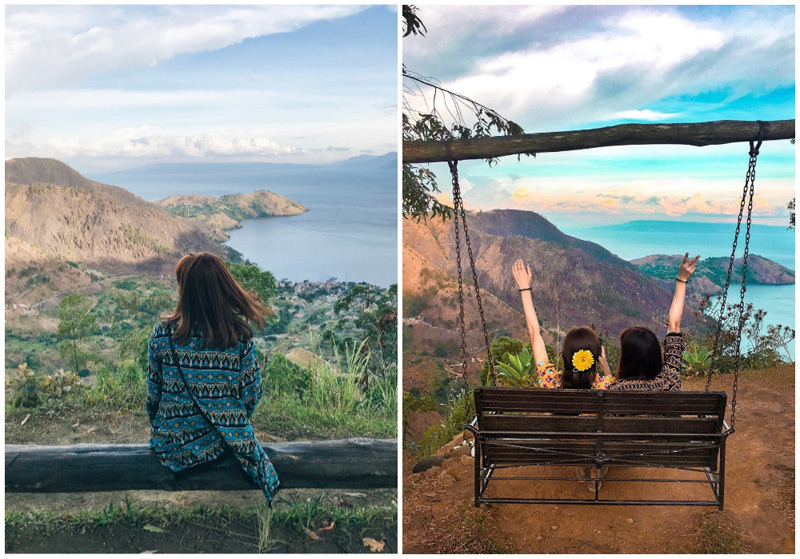 This magical place in Indonesia is actually even bigger than Singapore, and thanks to Indonesia’s diverse culture and the great location, diving into Lake Toba (not literally, although you can) is just like visiting a whole new country altogether! You’ll get to swim in the water, dance in traditional Batak clothes, explore volcanoes and even climb mountains! 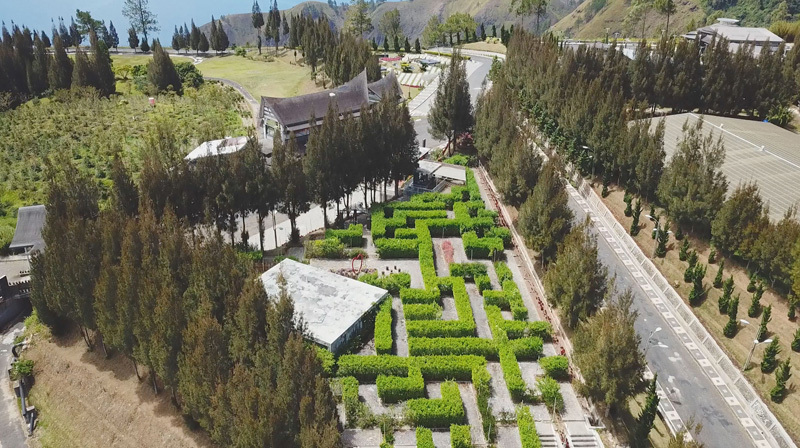 And guess what, the new Silangit airport is now open, so you can fly directly to Lake Toba instead of flying to Medan and taking a road trip to the lake. So much more convenient, no? 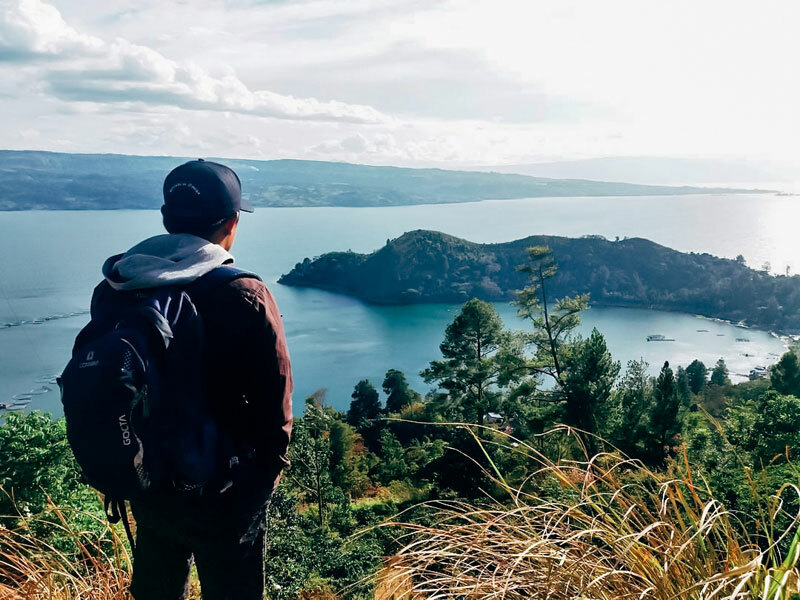 Check out our complete list of unbelievable activities that you can do in and around Lake Toba, and get ready to book that ticket! 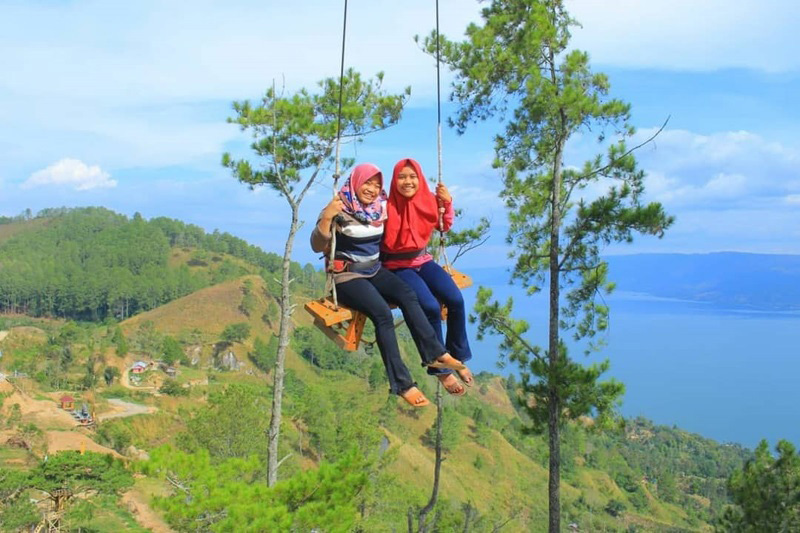 There are 2 ways to get to Lake Toba: 1. 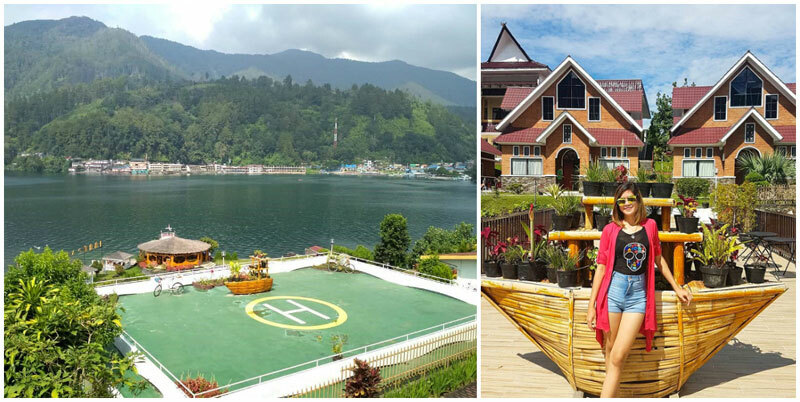 Fly directly to Lake Toba (Silangit Airport) or 2. fly to Medan and take a 4-hour car ride to Parapat. This story would not have been possible without the support of Indonesia Tourism Board. 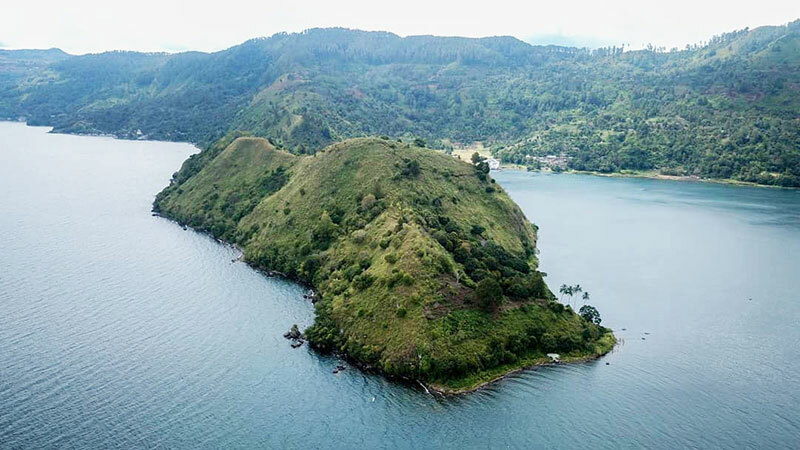 For more information, check out Lake Toba’s official website. Some might envy Iron Man for his super-cool suit, but we’ve always loved his glorious seaside home. 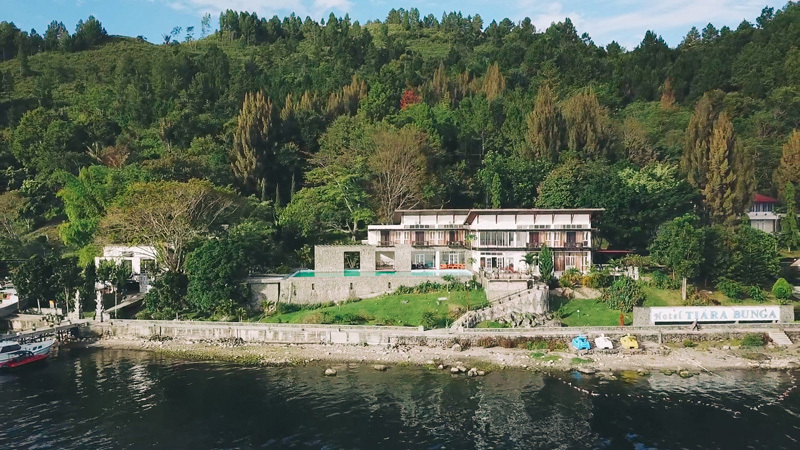 And now, you’ll finally have the chance to live like everyone’s favourite superhero at Tiara Bunga Hotel, a toned down version of Mr Stark’s home – with an equally gorgeous view of Lake Toba’s sparkling waters! Not feeling the exclusivity yet? What if we told you that the only way here is by boat? When our team visited the hotel, we almost couldn’t find it, only to realise that we had to take a 30-minute boat ride there! 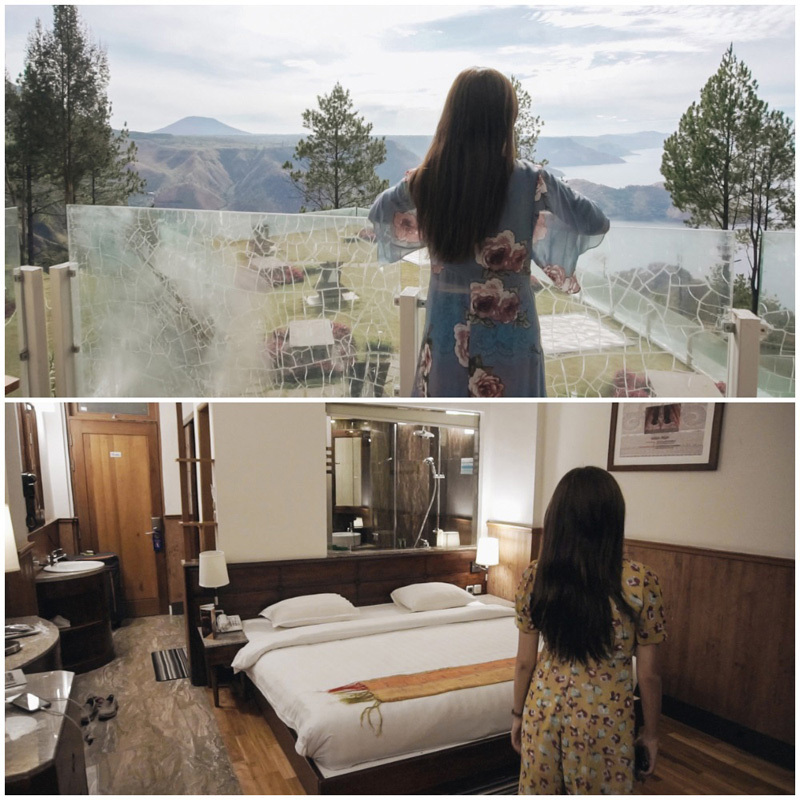 Once there, we were greeted by helpful staff who helped move our luggage, and guided us to a gorgeous room that oversees Lake Toba in all its glory. 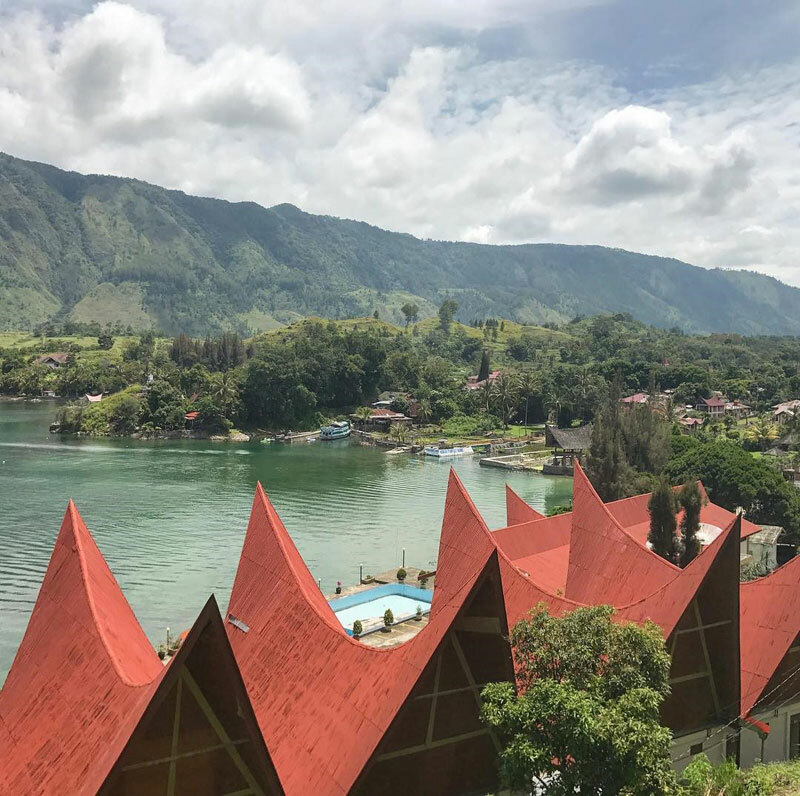 Just a little heads up for all you insect haters – the room doesn’t have air-conditioning and there may be some flying ants, but this is pretty normal in most lakeside hotels, and the chance to experience Lake Toba’s chilly weather is oh so worth it! You’ll likely be bumming around in the room all the time, but don’t forget to try out the water activities that the hotel has in store! If swimming’s not your thing, why not try your hand at canoeing or even relaxing by the bay with a fishing pole? 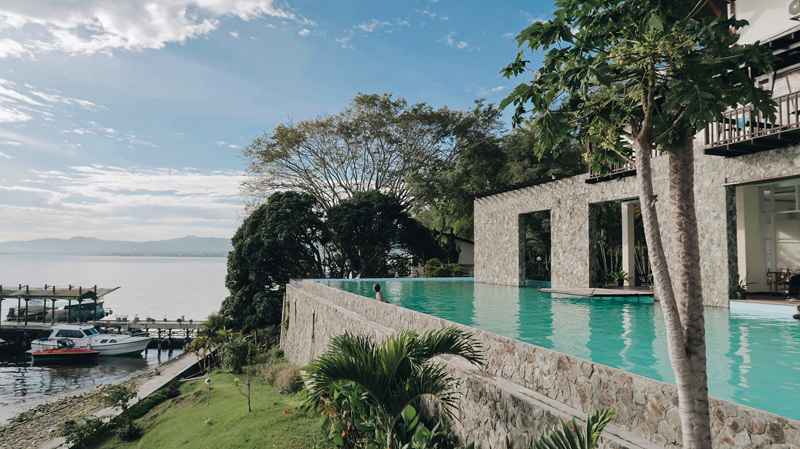 After a tiring day soaking in the calm water, enjoy a walk around the villa, or catch the sunset from your balcony before you retire to your luxurious bed. Just make sure to wake up a little earlier so you can catch the gorgeous sunrise views from the hotel pool. Psst – you can even have your breakfast in bed, or at the pool like we did! Love sunrises? You won’t get a better view then the one at One Tree Hill (not the famous TV series). 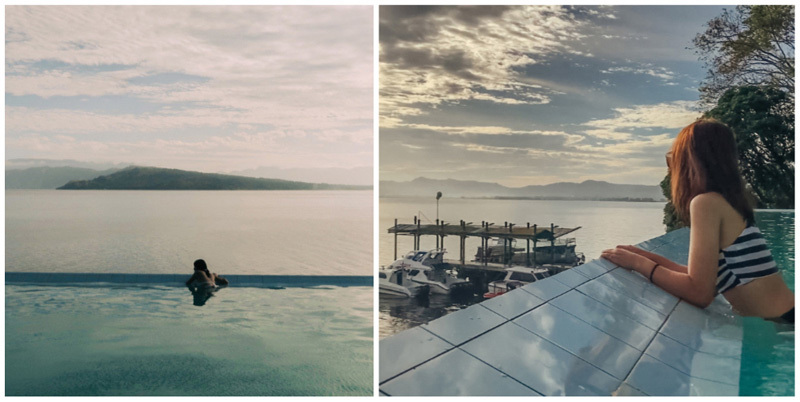 It’s not just the best spot for sunrises in Lake Toba – it’s the best in Indonesia! And there’s a good reason for it. 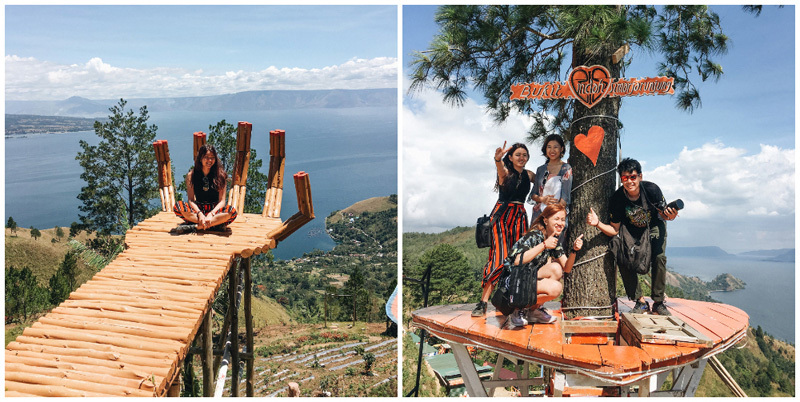 We were pleasantly surprised to find a boat docked at the viewpoint for photo-taking – fellow Instagrammers will probably agree that props make a photo so much nicer! 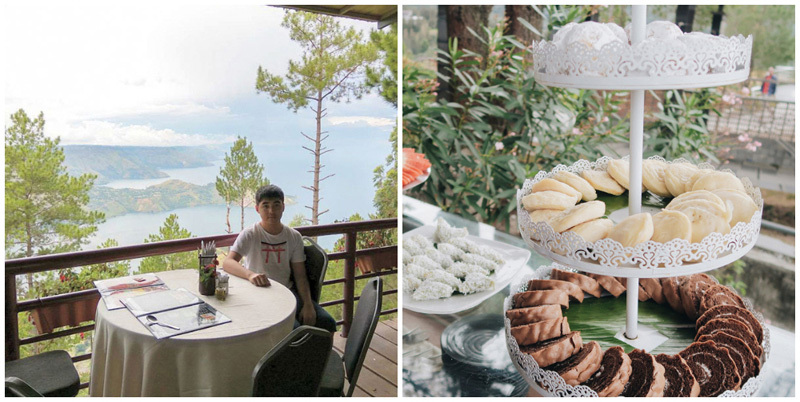 Better yet, One Tree Hill is only a short 10-minute drive from the cosy comfort of Taman Simalem Resort, where you can also enjoy jaw-dropping lake views right from the Lake View Room! Do take note of which season you choose to visit – it was too misty when we were there, so we couldn’t really see the lake. But that’s not such a huge problem when the best sunrise spot is right within arm’s reach! Other than 5-star views, you’ll also be getting some 5-star service. Our team was sent to the restaurant on a buggy, and the staff even turned back to pick up our lost camera cover! And foodies, good food abounds here. From buffet dinners chock full of Western goodness at Pengambatan Cafe, to savoury breakfasts at Tea House, there wasn’t a single bite that we didn’t love! When you’re not getting lost in the view or stuffing yourself silly, you’ll also be fully entertained by the wide range of activities the resort has planned for you. 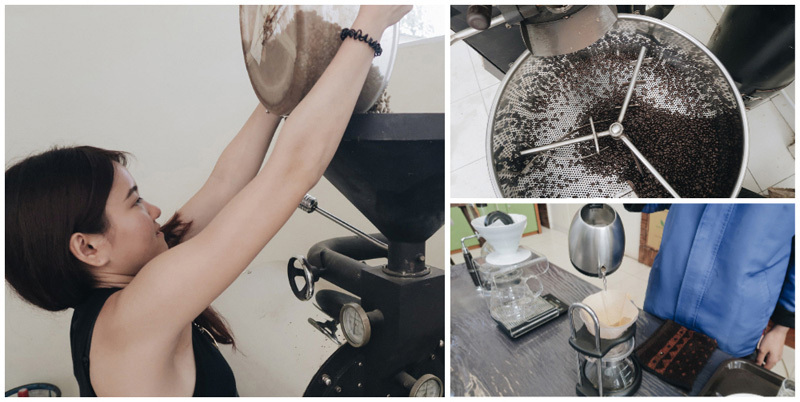 Our team enjoyed the coffee-making experience, but if caffeine doesn’t get you going, there’s also a labyrinth to explore, air-biking and more! Just be sure to bundle up, since it can get pretty chilly up here – but then again, who has time to freeze when you’re having so much fun? Address: Jalan Raya Merek – Sidikalang Km. 9, Sidikalang, Kodon-Kodon, Merek, Kabupaten Dairi, Sumatera Utara. 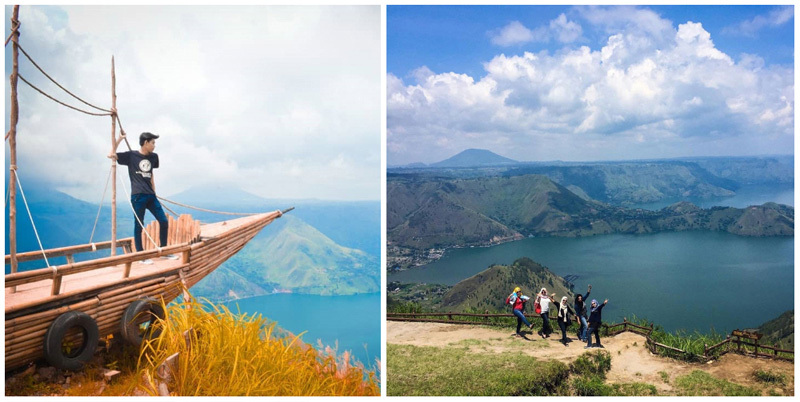 Everyone loves a good two for one – what if we tell you that you can explore Holland and Lake Toba at the same time? 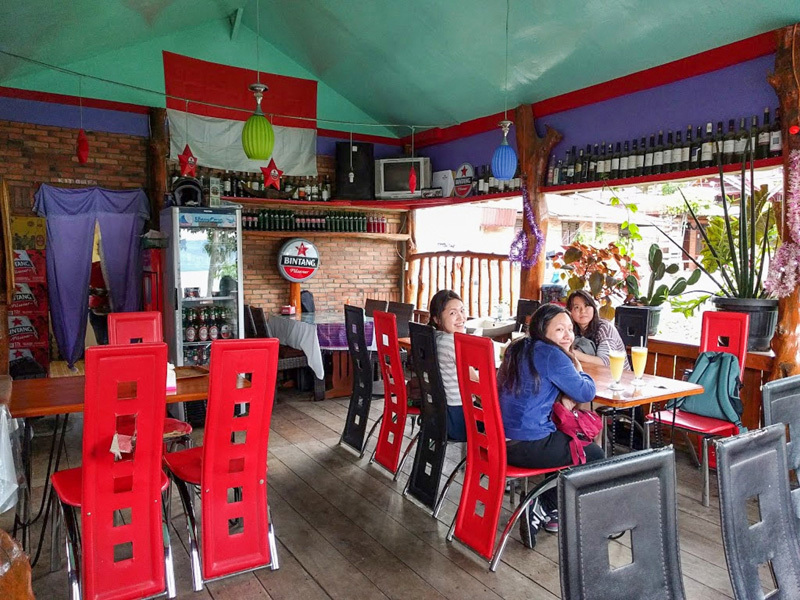 Inna Parapat Hotel is a quaint little establishment that just might have you getting a little confused. 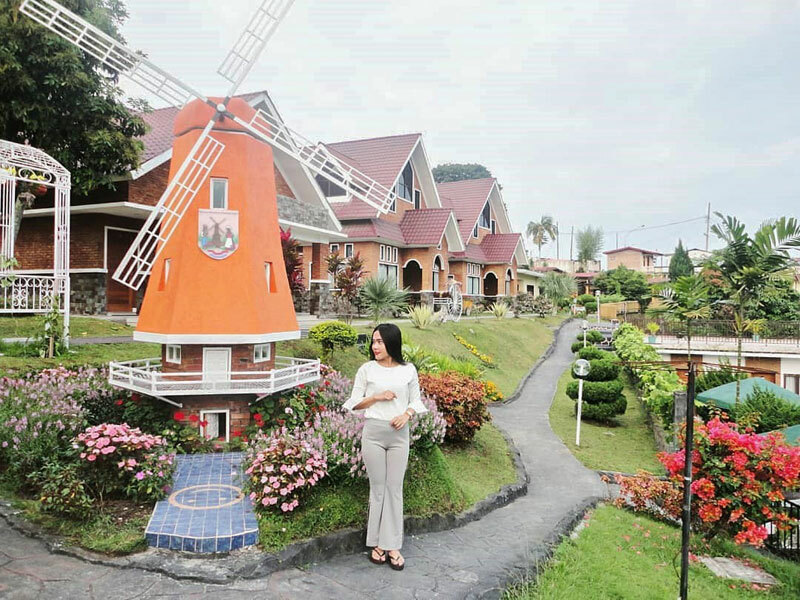 Take a stroll in the hotel’s premises and find yourself transported into Holland, with cute windmills and buildings that simply scream ‘Dutch’! 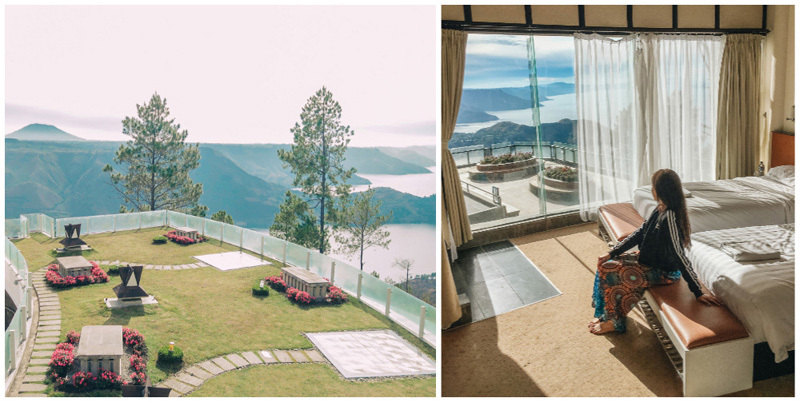 Then take a turn, and be wowed again by the sweeping vistas of Lake Toba’s surroundings. Who said you can’t have the best of both worlds? 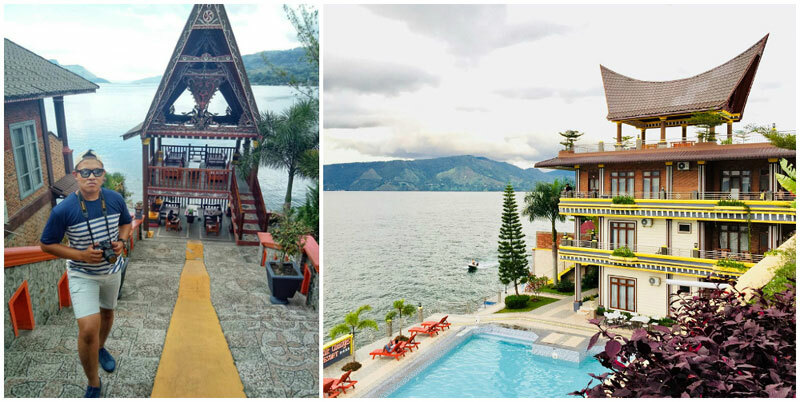 After exploring Indonesia’s mini Holland, dive into Lake Toba’s cool waters before you fill up your tummy with mouth-watering goodies from Inna Parapat’s kitchen. Even picky eaters will have no worries here, since the hotel serves both traditional Indonesian and International cuisine – the best of both worlds indeed! Address: Jl. Marihat No. 1, Parapat, Sumatera Utara. Guys, if you’re fretting over good date ideas, what could get better than a date amongst fresh flowers? 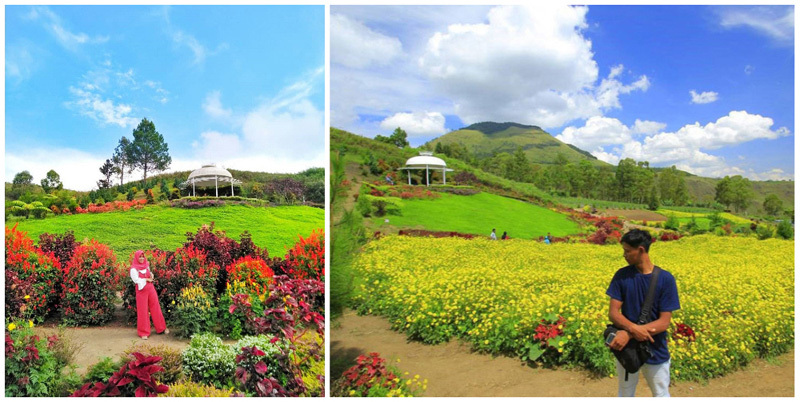 Sapo Juma Tongging Garden is the perfect place for couples to take lovely photos, have a picnic, or even propose! This lovely garden features a diverse variety of flowers in different colours, adding a splash of vibrancy to your holiday. 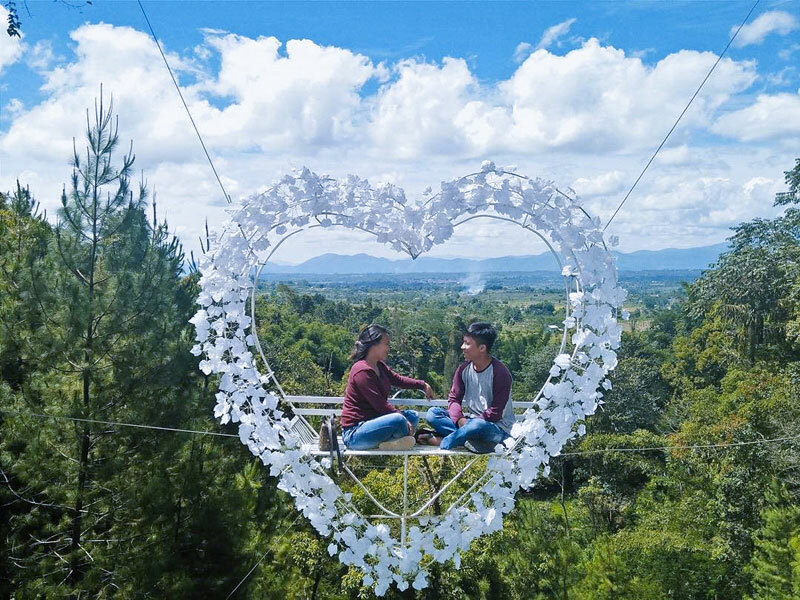 Just make sure you choose the perfect spot before you bend the knee and pop the question – when we were passing by, we saw that some flowers had withered due to the heat. 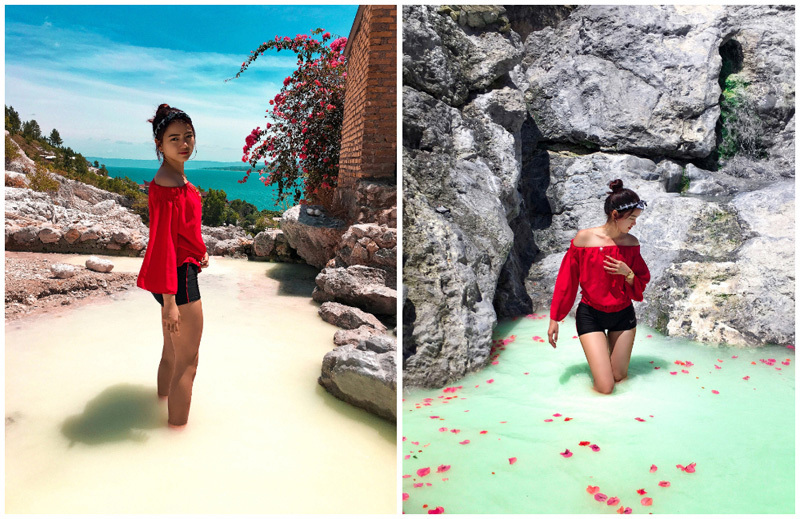 Even so, this is definitely a visual experience that will brighten up your holiday even if you’re a solo traveller, especially if you’re an Instagram lover or (budding) social media influencer. Just make sure to bring extra clothes or dresses, because that photoshoot is definitely not ending within an hour! Address: Desa Tongging, Kecamatan Merek, Kabupaten Karo, Sumatera Utara. 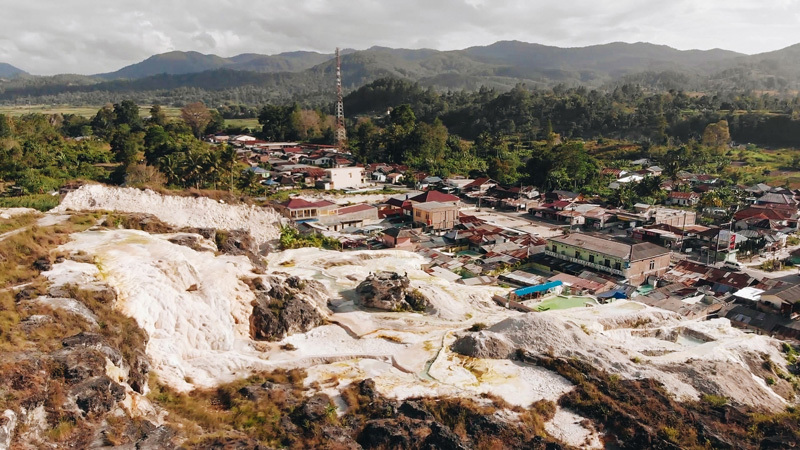 Well, you’re not really entering the Teletubbies’ world, but Bukit Holbung is also known as Teletubbies Hill and we’re not questioning it. 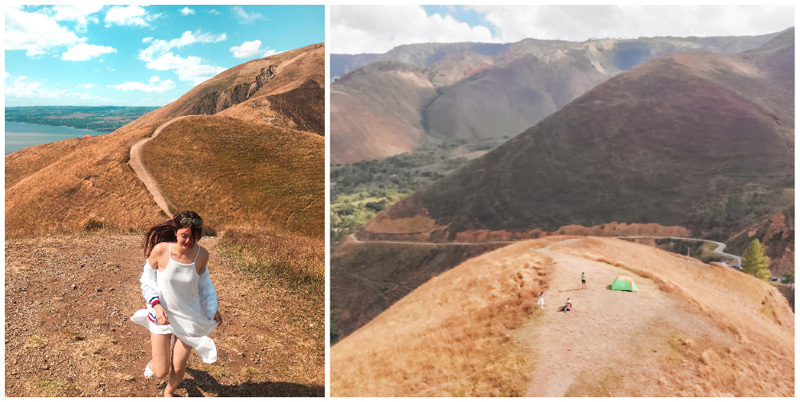 The greenery, the mountains, the clear air – all that’s missing is the baby in the sun and a sweet little “Po!” and you have a perfect Teletubbies world. Most people come here to go for a simple hike, which takes about 10 to 15 minutes. 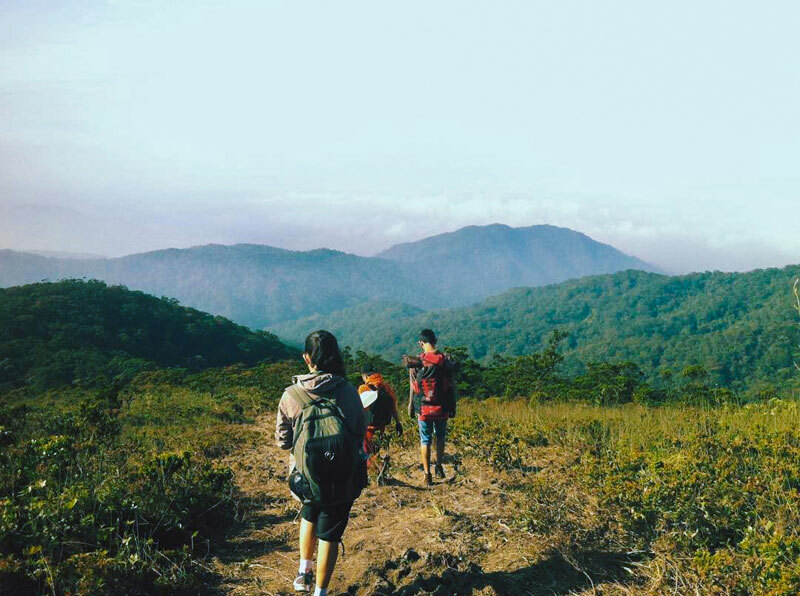 This is one hike that even couch potatoes can proudly conquer – there’s already a paveway, so you don’t really have to work as hard and can enjoy the view of beautiful green mountains instead. It can get pretty windy at times, so if you want your hike to be more comfortable, go when the sun is out! 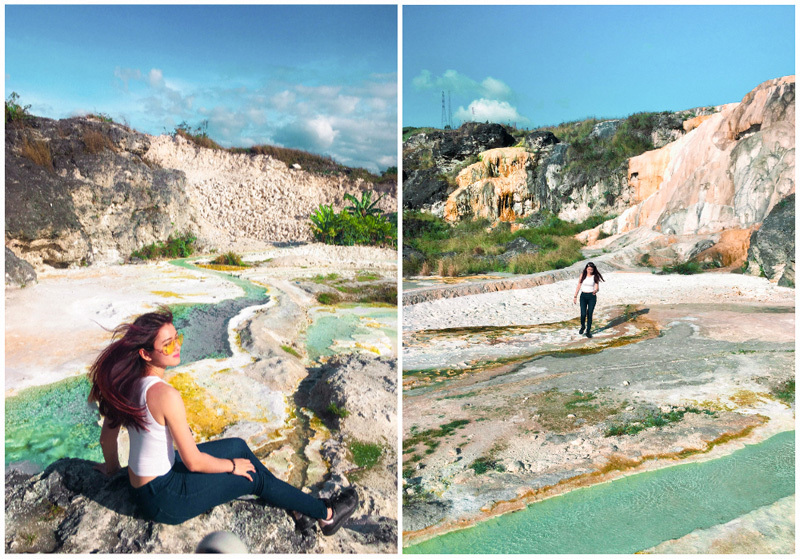 You might not have Dipsy, Po and nursery rhymes, but the gorgeous scenery and air clear as crystals should take you back to that same feeling of happy comfort that Teletubbies gave you as a child. Can’t bear to leave? Just pitch a tent and bask in the glorious views forever! Address: Dolok Raja, Harian, Samosir Regency, North Sumatra, Indonesia. Coordinates here. Getting there: There are two routes to this hill. The first, from Medan to Tele. Along that trail you will pass through Kebanjahe. 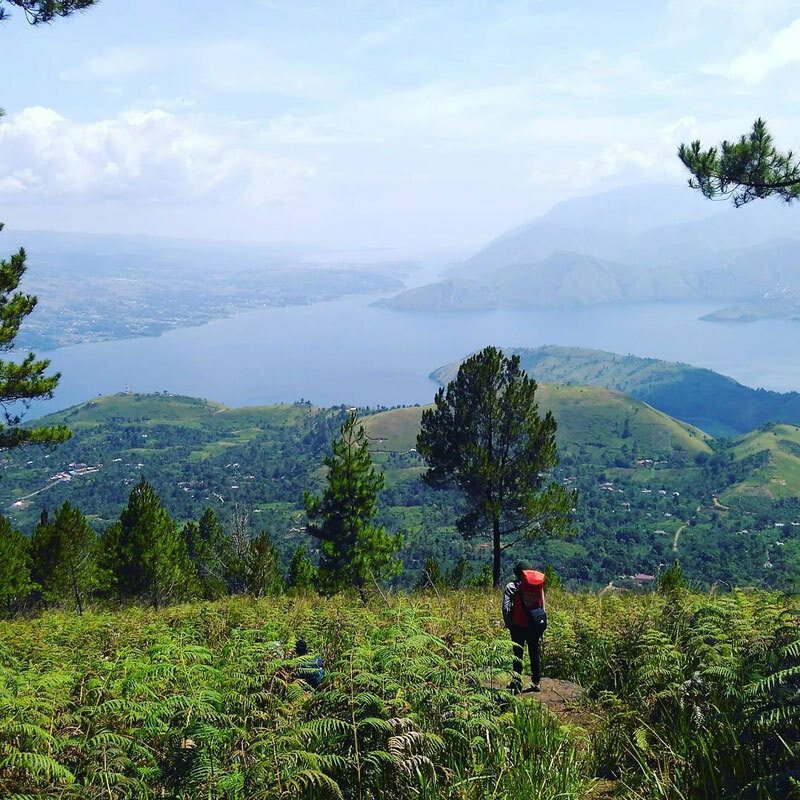 The other route is via Siantar, Parapat, in Samosir. Depending on where you start, taking the second route will require you to go through Pelabuhan Tiga Rajato to get to Tomok. 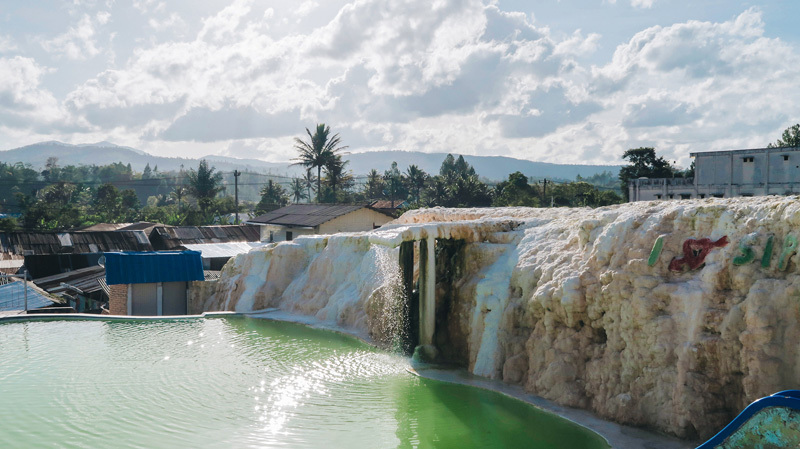 These hot springs have been called the “soda water pools” as the baths supposedly taste like a dirty carbonated beverage (we don’t recommend trying it). 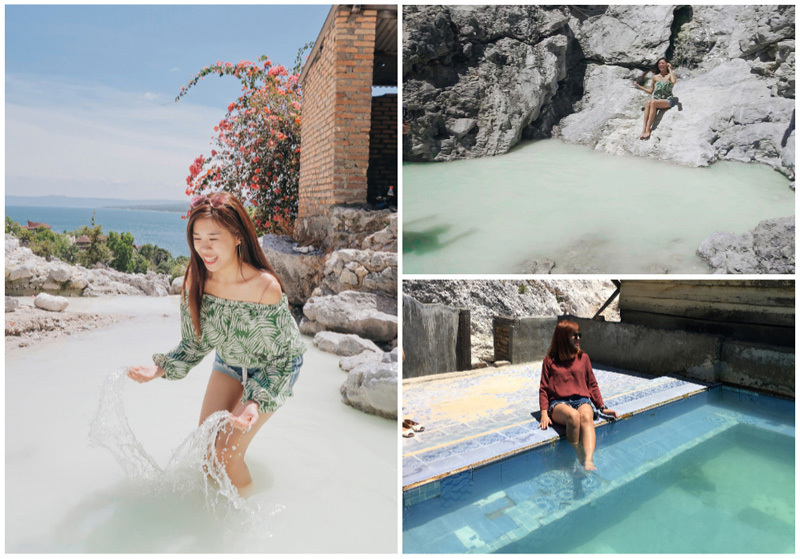 The waters are a vibrant blue-green due to their sulphurous content, and the surrounding limestone hills dot the area with hues of orange, yellow, and green – such a picturesque landscape! Make sure you bring your swimming suit if you’re keen to bathe in the sulphur springs pool. Sulphur is known to for its healthy, healing properties so after dousing in the pools you’ll emerge with a soft radiant glow. That is… if you don’t mind emerging with a slight – okay, strong – stink. Our team was there and we did not quite like the sulphur smell though we loved the view. For those of you with a sensitive nose, we’d highly recommend that you bring along a mask. Feeling hungry after your soak? 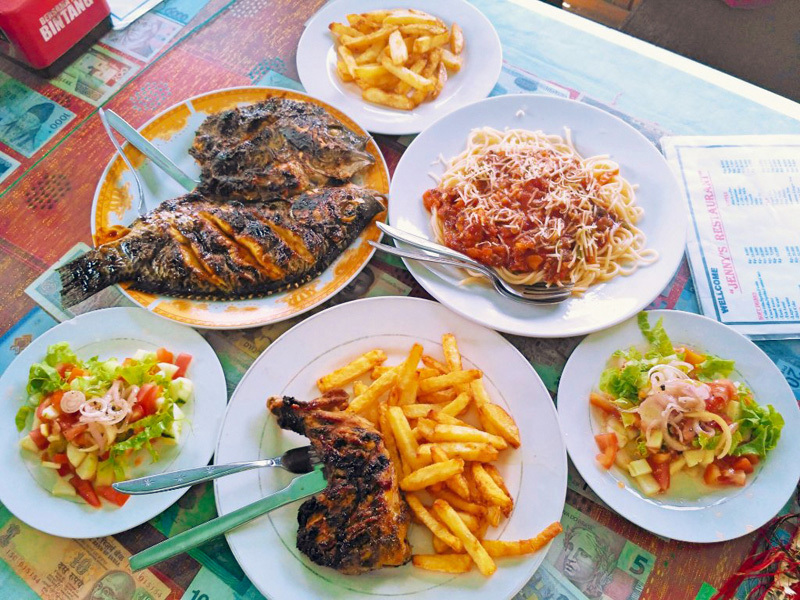 We recommend trying some delicious local cuisine at one of the North Tapanuli restaurants nearby. You’ll enjoy them! Address: Situmeang Hasundutan, Sipoholon, North Tapanuli Regency, North Sumatra 22452, Indonesia. Coordinates here. 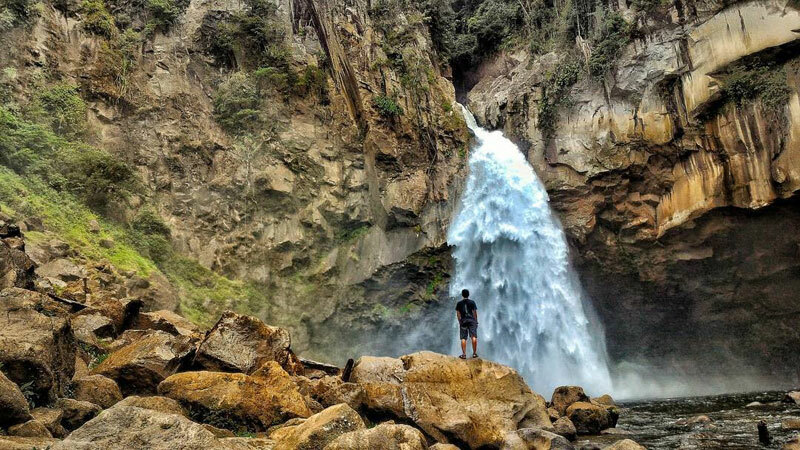 If you’re a fan of hiking, don’t miss this chance to hike down this gorgeous waterfall. 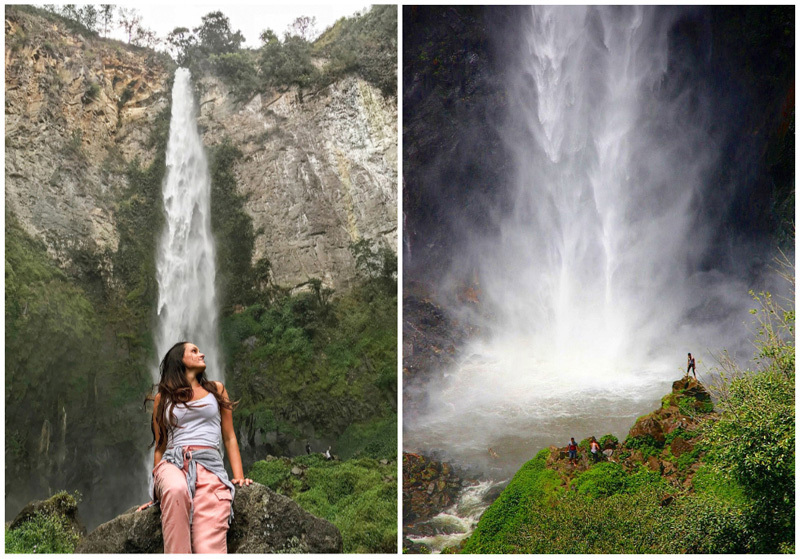 Reaching a height of 120m, this stunning waterfall is barricaded by endless greenery, making it the perfect destination for your next “I made it!’ photo. You might have to live with a couple of photobombers, though – when our team was last there, we noted that it’s much more touristy here, so don’t expect too much serene greenery! While a return trip to the falls may take a hefty 7 hours, it’s a must-go for avid hikers who also happen to love Instagramming their escapades. Address: Tongging, Merek, Karo Regency, North Sumatra 22173, Indonesia. Coordinates here. Getting there: Take a motorbike to Simanindo on the northeast corner of Samosir 20 minutes from Tuk Tuk; take a ferry to Tigaras. Then drive north with beautiful lake views to Merek, and ask for the turning to the waterfalls (signage only exists if you come from the north). Return via the same ferry, or via Parapat (further, but nicer road, so you will reach at the same time). 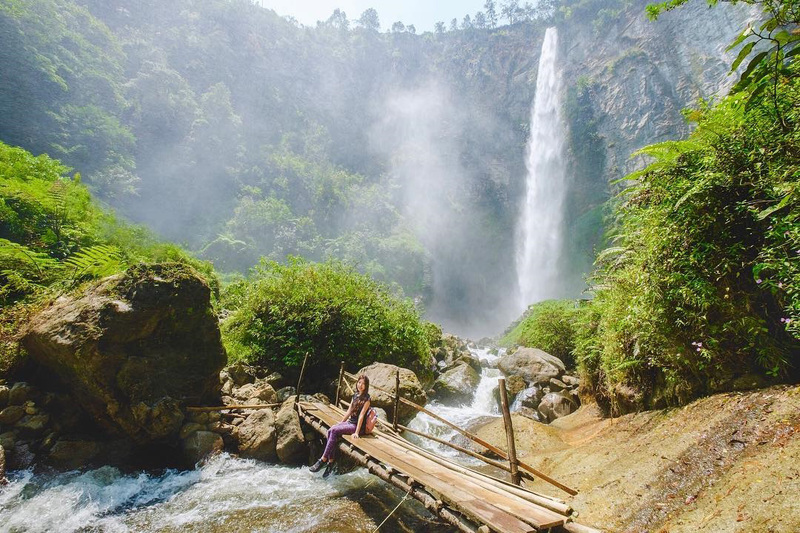 This tiny secluded village has more than just friendly faces, it’s also home to Indonesia’s best kept secrets – an everlasting field of green, the freshest air you’ll ever breathe in and even 7 gorgeous waterfalls! The drive here might be a little rough thanks to bad terrain, but it’s more than worth the temporary pain. Stand amidst the endless green and feel yourself sucked into the serene atmosphere of the Sound of Music – who knows, maybe you’ll even get in the mood for a song and dance right within these green hills!! You know what they say, the grass is always greener on the other side… but it’s green enough here, thank you very much. We suggest coming with a basket full of food and enjoying a quiet picnic while you’re here – just enjoy the scenery to the fullest! 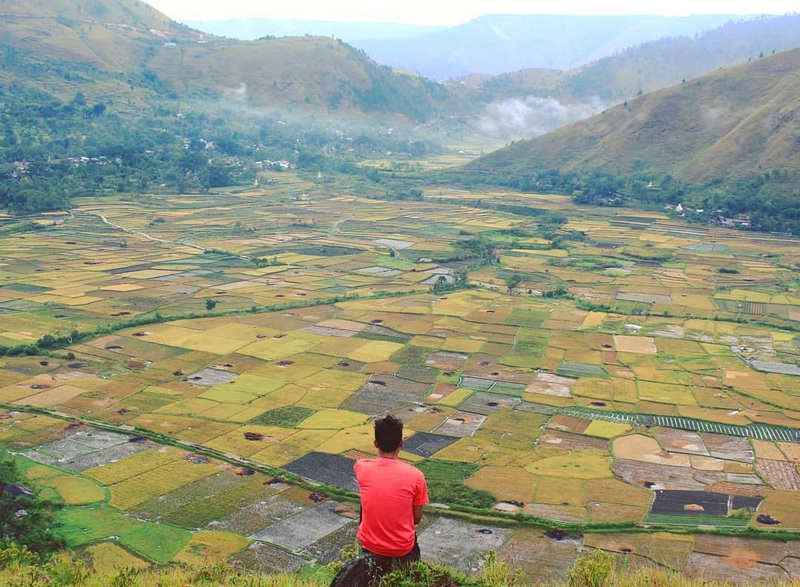 Address: Sianjur Mulamula District, Samosir, Sumatera Utara. Coordinates here. Getting there: You can get a boat to drop you off near Bonan Dolok village. 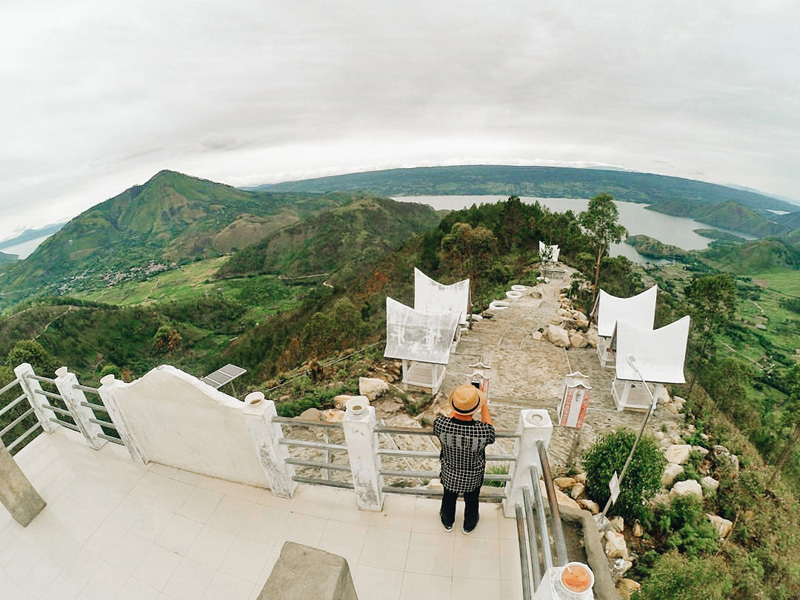 Don’t tell us you’ve been to Lake Toba if you haven’t visited this viewing tower in Samosir. This is one view (okay, three) that you simply can’t miss! 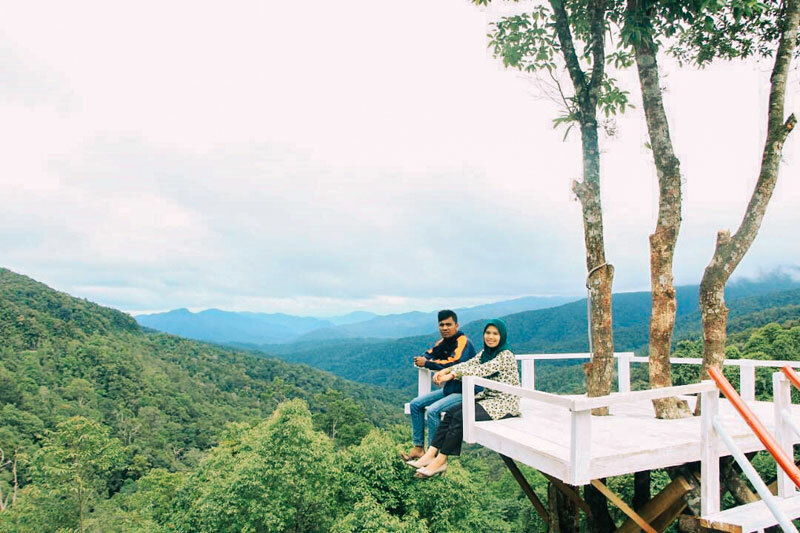 Menara Pandang Tele is located at one of the highest points of the area surrounding this lake, and the tower itself has 3 floors – each with a unique view of the breathtaking surroundings! While it was a pain to climb up the flights of stairs, we absolutely loved how picturesque each viewpoint was. 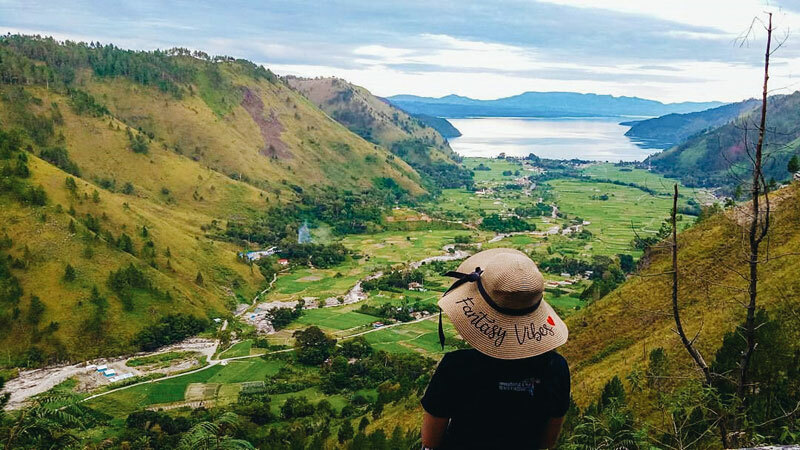 You can see Samosir Island, the legendary Gunung Pusuk Buhit, ranges of beautifully aligned mountains, and even the local houses from afar. It’s impossible to live on clouds, but if you want to get a feeling of what it would be like, this place will get you close enough! 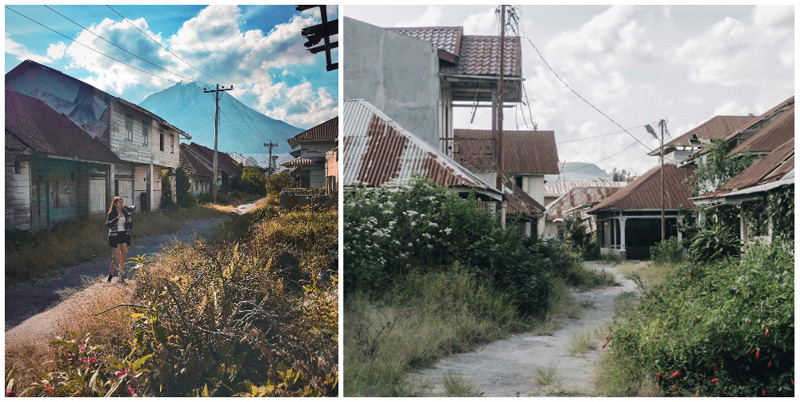 Have you heard about a hidden deserted town located in Mount Sinabung, where abandoned crumbling huts line the entire village, covered with tall unkempt weeds, broken gates and fallen roofs? And as you explore, you notice that not a single soul is in sight (or wait – is that a fleeting shadow you missed in the corner of your eye?). Everything is silent except for the sound of your shoes treading on the overgrown weeds. 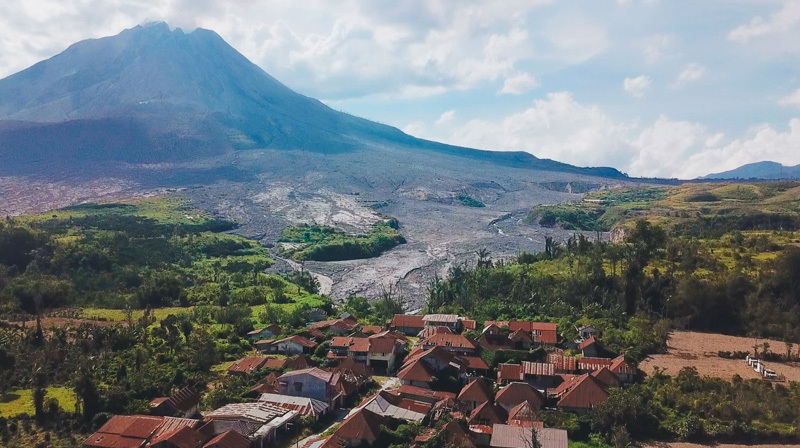 Once upon a time, this was a vibrant farming village, but the volcano came roaring to life, spewing ashes everywhere, and causing almost 10,000 villagers to flee the area. Mount Sinabung went back to sleep for 400 years, before awakening again in 2010, killing 7 people and another 16 in 2014. Another eruption in 2017 caused more than 3,000 families to be evacuated, and yet another occurred in early 2018. Due to this series of eruptions, officials declared this area as an exclusion zone, and people were forbidden to enter. In 2017, it was reported that there were 7 abandoned villages in this zone, namely Gamber, Sukanalu, Guru Kinayan, Simacem, Kuta Gugung, Berastepu and Sibintun. Since then, some people have said that this place is haunted. Others have seen ghosts, while horror stories continue to circulate. But are they urban legends or something more? We leave you to decide – enter this ‘red zone’ at your own risk! 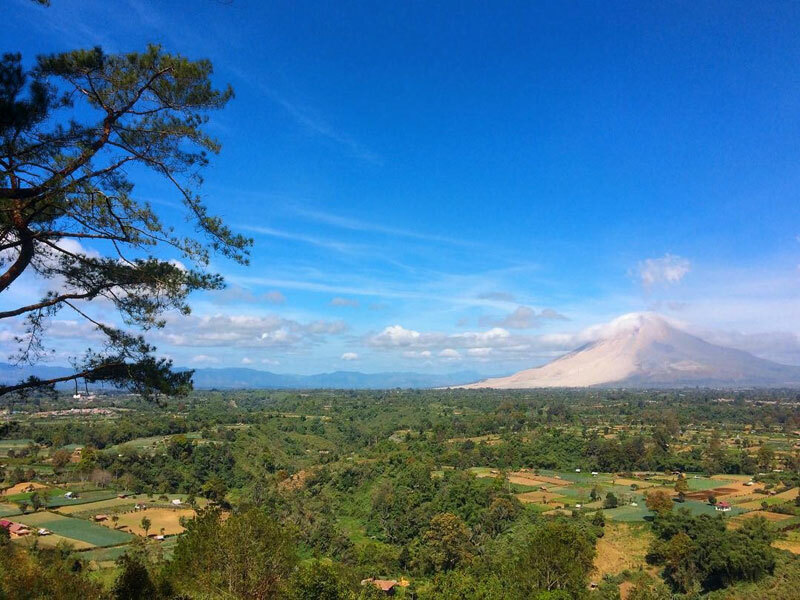 What we know for sure – this place has a really good view of Mount Sinabung! TripCanvas Tip: Do remember to bring your insect repellent, we were stung pretty badly by the mosquitoes! Address: Desa Berastepu, Simpang Empat, Karo Regency, North Sumatra, Indonesia. Coordinates here. Surely you weren’t thinking about vacationing near water without actually eating seafood? Jenny’s serves freshly grilled seafood, but if seafood is not your style, you can still get barbequed meat and some Western wonders like burgers and steaks. However, most visitors recommend that you taste the grilled fish of the day if you’re at Jenny’s, so don’t leave without trying the house special! Better yet, time your dinner so that you can enjoy the sunset glow as you down mouthfuls of the juiciest fish you’ll ever eat in this life. You might even want to call ahead to reserve a space, since Jenny’s is pretty popular amongst tourists! 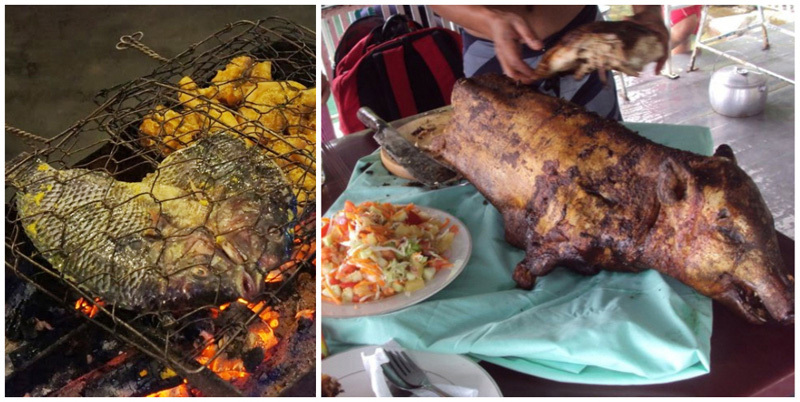 Grilled fish, a good sambal, friends… can it possibly get any better? 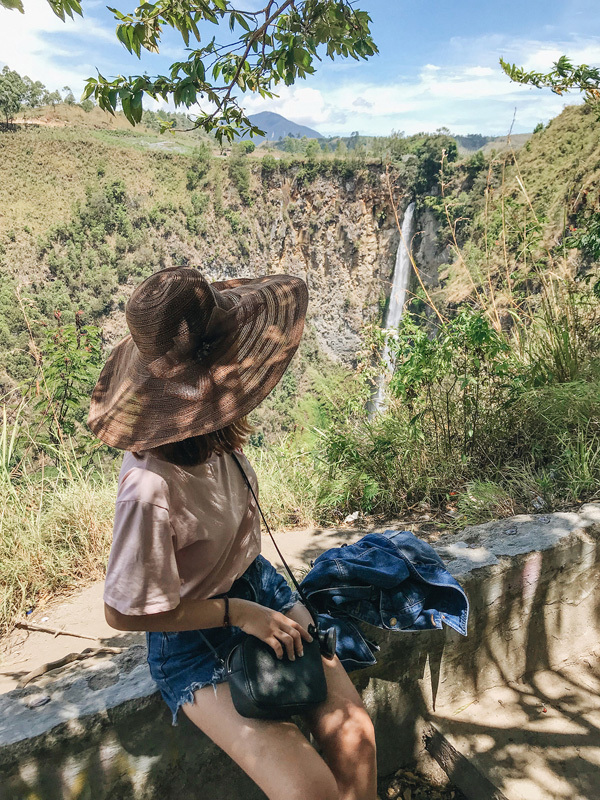 Don’t worry, we’re not talking about two waterfalls here – the Situmurun Waterfall is also known as Binangalom Waterfall because its water originated from the village of Binangalom. 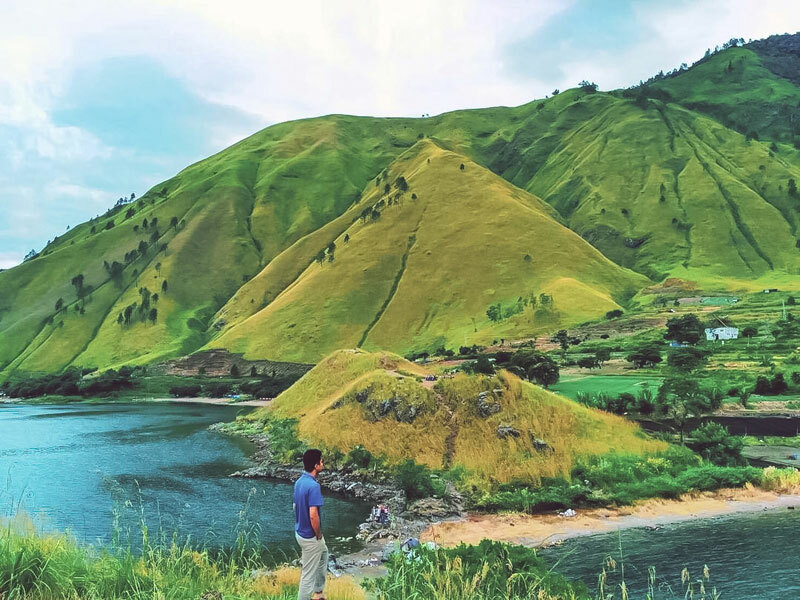 The name of the village, when translated from Batak language (the language of the Lake Toba locals), means ‘the water that calms your soul’. Nope, this isn’t backed up by science, but it does it matter when we have clear waters, the crisp sound of the waterfall and a majestic view of waves tumbling over rocks right before us? It’s almost hard not to feel calm when you’re standing in the heart of nature’s beauty. Getting here won’t be easy though – but the most beautiful gems are always hidden, so put on your best sneakers (you might want to bring a spare pair) and trek away! Tread carefully and don’t rush through the journey, because the way there is just as beautiful – stop if you need to and bask in the wonders of Mother Nature! 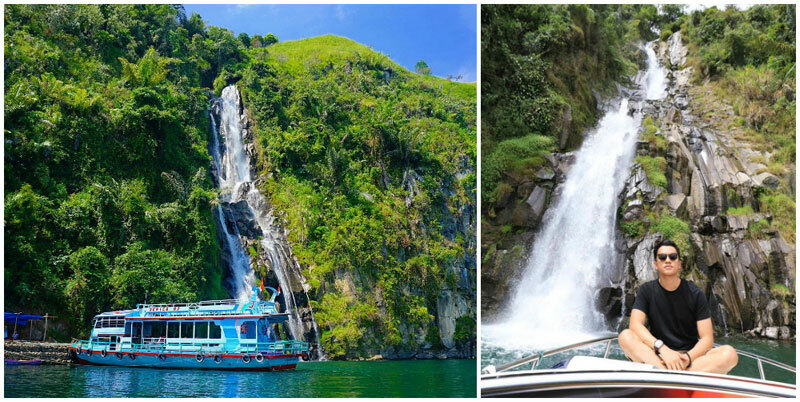 TripCanvas Tip: To reach this waterfall, you will need to charter a private boat that costs Rp.1,700,000 for the entire boat (approximately USD $117) which seats up to 10 people. The entire trip will take 4 to 5 hours. 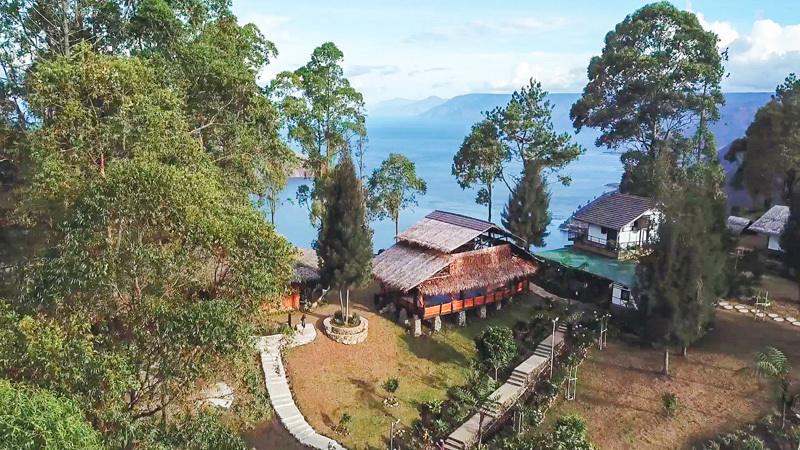 Address: Desa Binangalom, Kecamatan Lumban Julu, Kabupaten Toba Samosir, Sumatera Utara. Coordinates here. Getting there: If you’re coming from Medan, make your way to Kota Parapat via bus such as Intra or Sejahtera. It will take approximately 6 hours and will cost around Rp. 25,000 – Rp. 35,000 (approximately USD 1.70 to 2.40). You can also rent a car from Parapat and head to Pelabuhan Ajibata. From there, you can ask the locals for any motorboat rentals. The journey from Pelabuhan Ajibata to Situmurun will take around 2 to 3 hours. 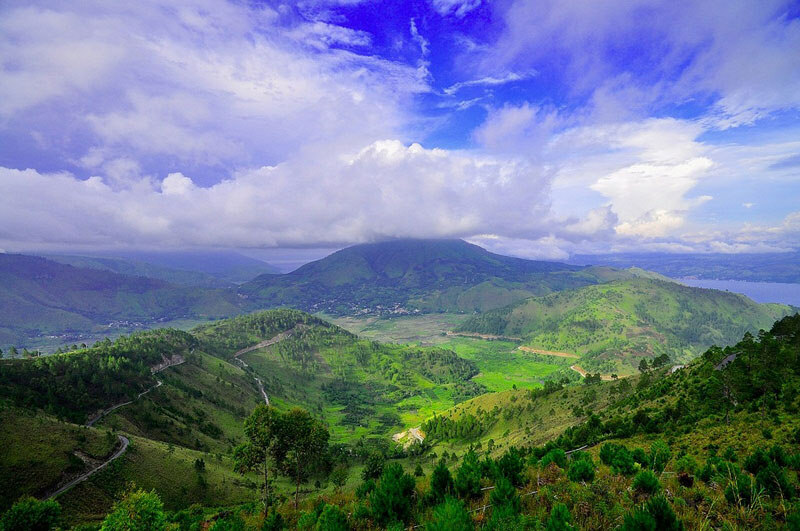 Bakkara Valley is the place where the Aek Silang River and Aek Simangira River meet, but it’s also the place where ancient tradition comes in touch with natural wonder! 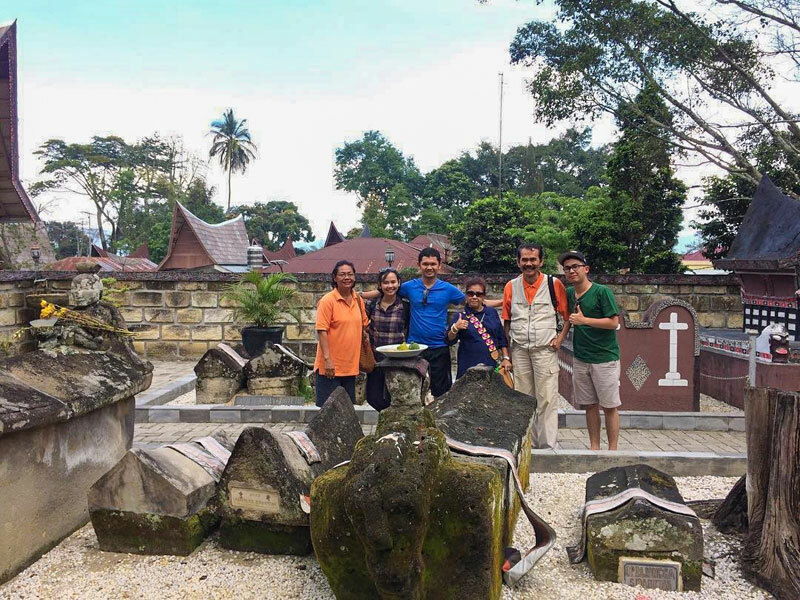 This place is the birthplace of King Sisingamangaraja XII, a local warrior from Sumatera Utara, who fought against the Dutch during the war. It’s not an exaggeration when we say that Bakkara Valley looks like a painting. When the deep maroon water from Aek Silang comes together with the clear, white water from Aek Simangira, it’s like watching nature mix its own colour palette! People who have visited Bakkara Valley call this place ‘Heaven on Earth’, and it’s hard to disagree when everything here seems so magical. 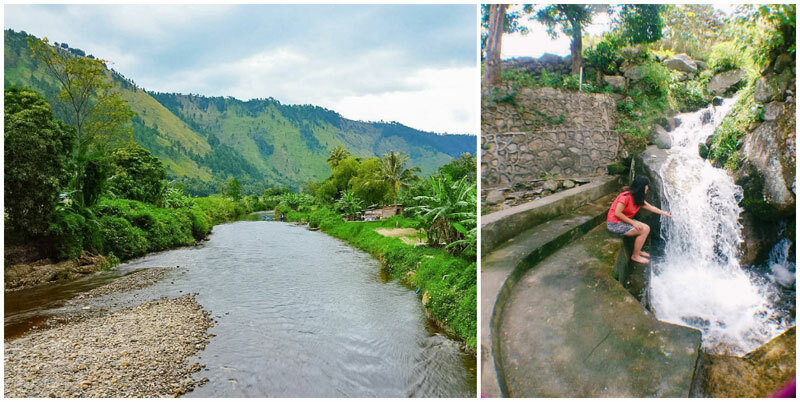 The valley is even known for Aek Sipangolu (living water), water that can supposedly heal any disease. Are the legends true? We guess you can head there and find out yourself! Address: Kabupaten Humbang Hasundutan, Kecamatan Baktiraja, Sumatera Utara. Coordinates here. If you’re unwilling to part with this scenery, there are also rooms here that you can rent for the night, ranging from Rp. 100,000 – Rp. 300,000 (approximately USD 7 to 21). 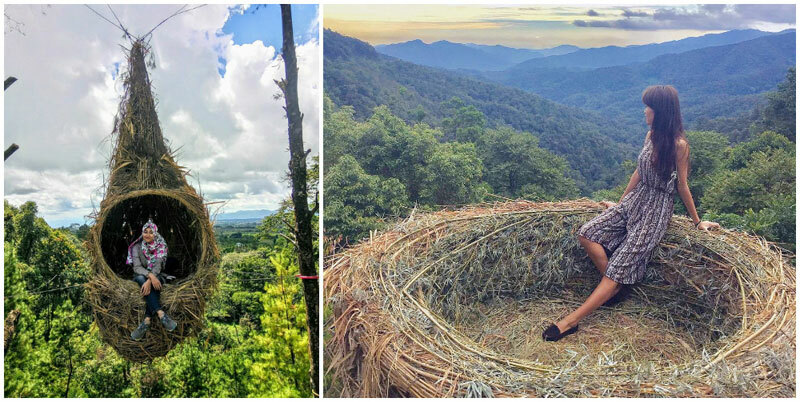 Sadly, you won’t be staying in a bird’s nest, but a cosy room surrounded by nests instead. Just remember to come back to civilisation after you’re done bonding with Mother Nature! What’s the point of going to a lake if you don’t explore its waters? But then again, who wants to go on another one of those nondescript cruises? Fret not, for this is a cruise unlike any other. 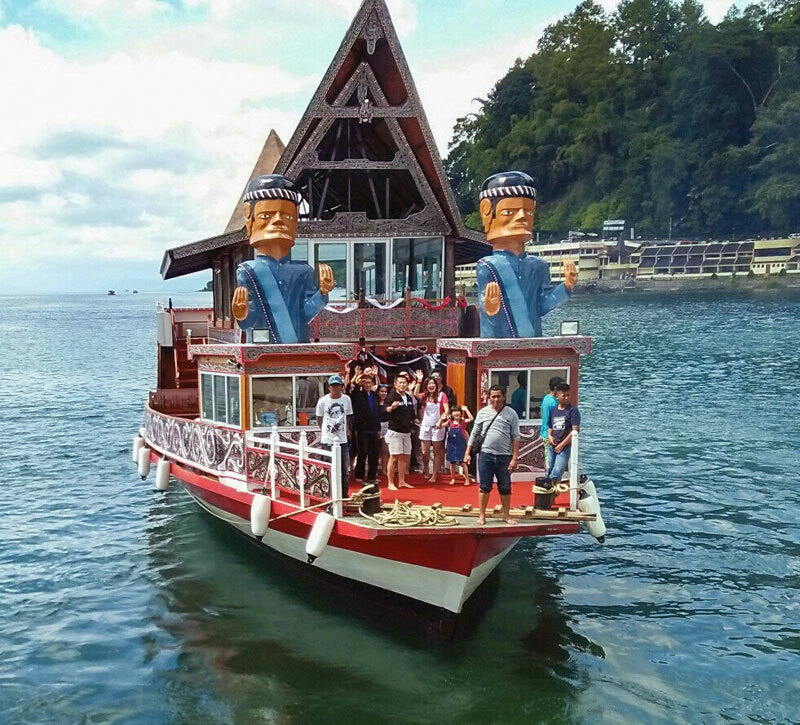 This specific cruise ship that you’re about to get on belonged to the rulers of Samosir, and is shaped like a traditional house with a pointed roof. Standing at 21.5 metres long and 7 metres wide, intriguing engravings can be found all along the ship’s body. That’s not the only interesting thing on this ship – at the front of the boat, you’ll see two big male statues dressed up in traditional clothes (look here Instagram stars!). Frankly speaking, if this was just another ship, we’d say skip it, but this ship, with all its heritage and intrigue, is definitely worth a ride. Do note that for safety reasons, only 20 people are allowed to board this cruise ship at one time, so make sure you book your place fast, for once the ship has sailed (hur hur), there’s no going back! Address: Parapat, Sumatera Utara. Coordinates here. Getting there: Board from Tomok Pier. It sails through Tomok, Batu Gantung, Parapat, Air Terjun Situmurun Binangalom before returning to Tomok. Everyone wants their holiday to be smooth instead of rocky, but sometimes, rocky may be good too… especially when it comes to waterfalls. 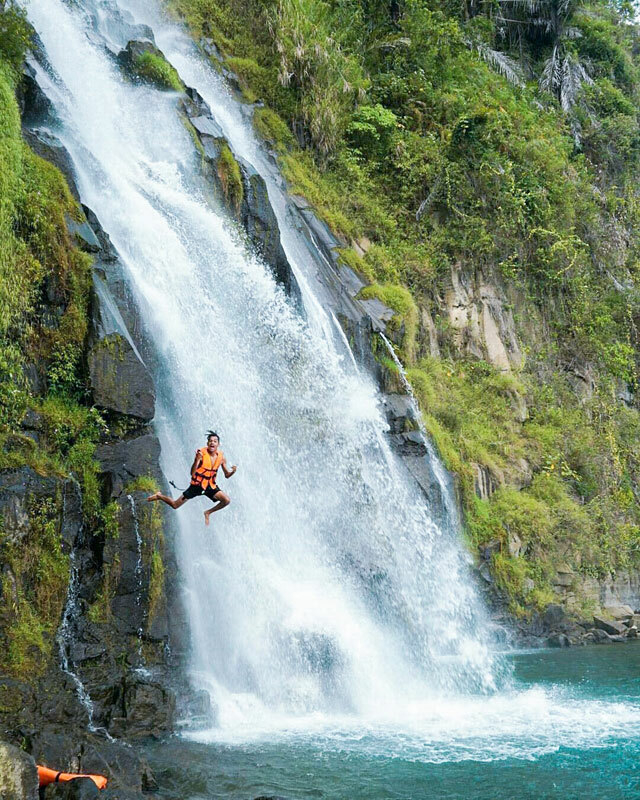 The Turunan Bolon (Turbo) Waterfall, also known as Naga Waterfall, falls from a formation of cracks on the big rocky mountain located in Tomuan Holbung Valley. The splashing water almost looks like it’s spitting out of a dragon’s mouth, which is probably why the waterfall is named Naga (‘dragon’ in Indonesian). 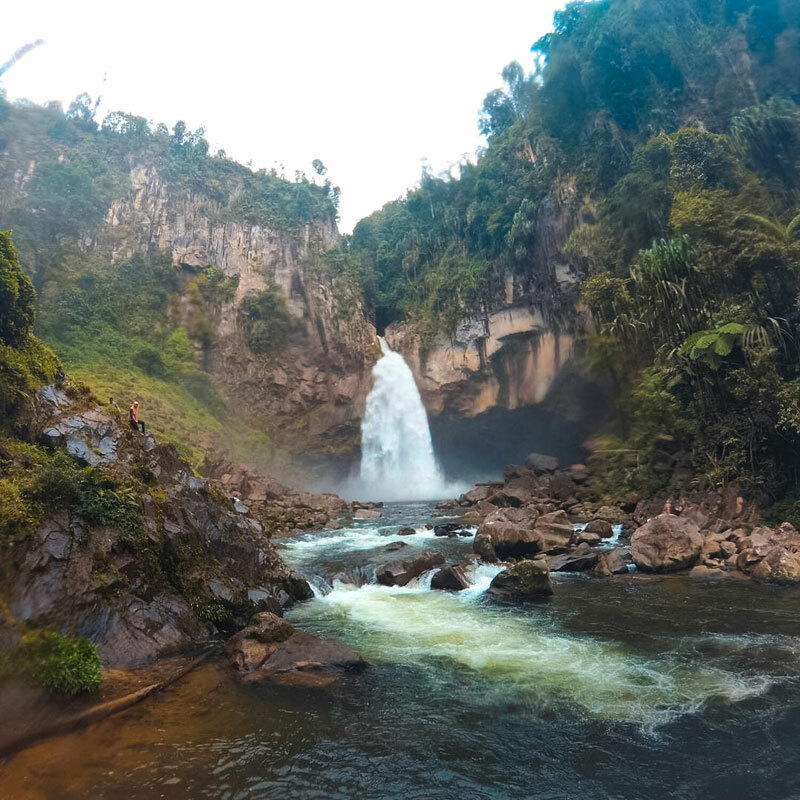 Surrounded by a mix of greenery and rocky terrain, this waterfall is definitely breathtaking – but so is the journey there. Because it’s mostly surrounded by rocks, you’ll need to be careful with your steps, so we suggest wearing proper sneakers, and getting a heavy-duty vehicle. You’ll also have to take roughly 30 minutes to get through the fast river stream, so yes, you will get wet – but when you get there, we promise it’ll be worth it! Address: Desa Tomuan Holbung Kecamatan Bandar Pasir Mandoge Kabupaten Asahan, Sumatera Utara. Coordinates here. Getting there: 6 hours trip from Medan and 3 hours from Pematang Siantar via Tanah Jawa Simalungun-Mandoge (if you’re coming from Medan). This small yet vibrant village is one of the strongholds of Indonesian heritage and culture, so if you’re after the genuine side of Indonesia, here’s the place to go. 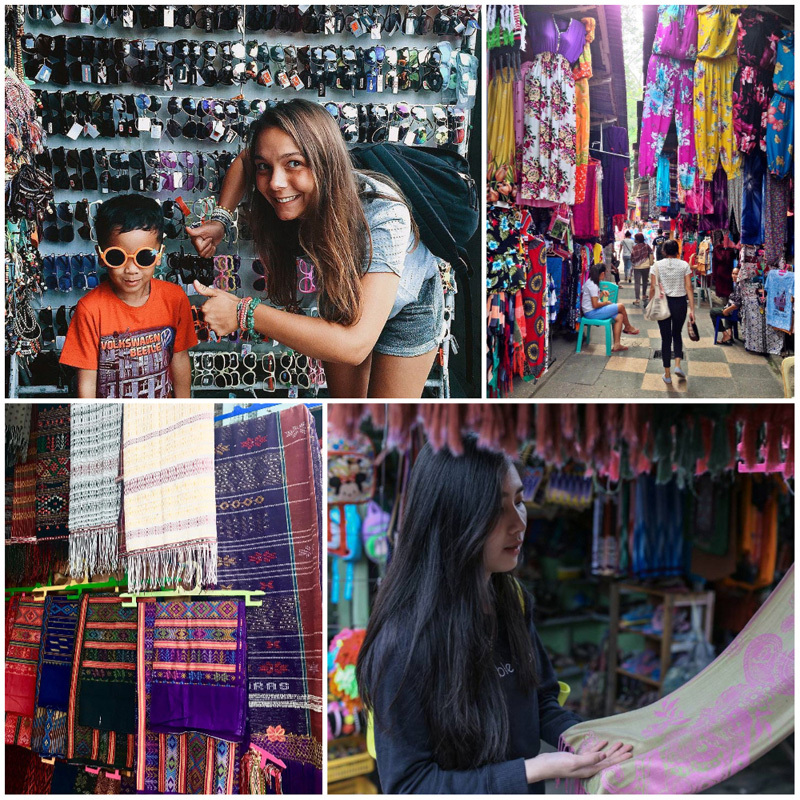 There are 5 main attractions, and the locals are always happy to share their stories! If you’re lucky, you might be greeted with a Tor-tor dance by the locals and the Sigale-gale doll, a Bataknese traditional doll that moves and dances on its own! Don’t get scared – just like a marionette, it’s operated through a set of strings. If the dance is not on, you can still request for a show with a small fee of Rp.200,000 per show (approximately USD 14). Have you ever entered a royal tomb before? 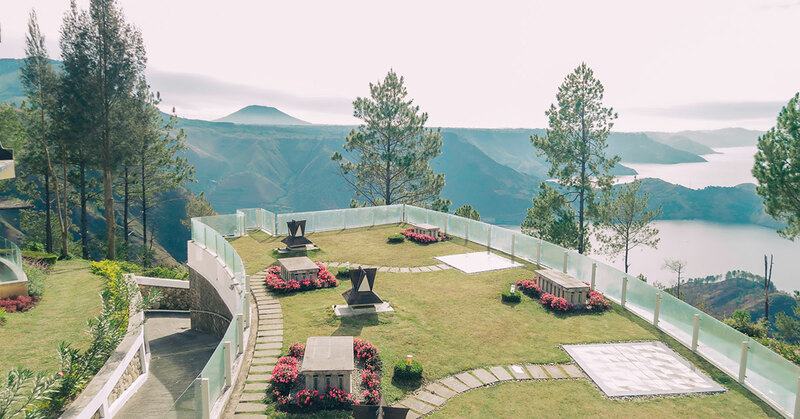 Why not explore the Batak Kings’ final resting place? Once you enter the tomb, you’ll see a brick coffin with a carved statue of a head. The coffin was never buried underground, and houses the remains of the Kings from the Sidabutur ancestry. 3 kings and their ancestors were encased in this tomb, and their bodies can be found in a coffin made from natural stones. Before you think that that these are just random stones, take a closer look and discover glimpses of a life far gone, back when tradition was king and faces carved on stones were seen as a luxury. In the Batak tradition, coffins can identify your status. Poor families simply have their bodies wrapped in straw mats, while wealthier families have coffins made out of wood and carved heads of animals, and royals have coffins made of stones – which are more complex to carve. Take your time as you explore the tomb – by the end of it all, you might just feel like you’ve taken a trip to and back from ancient Indonesia. 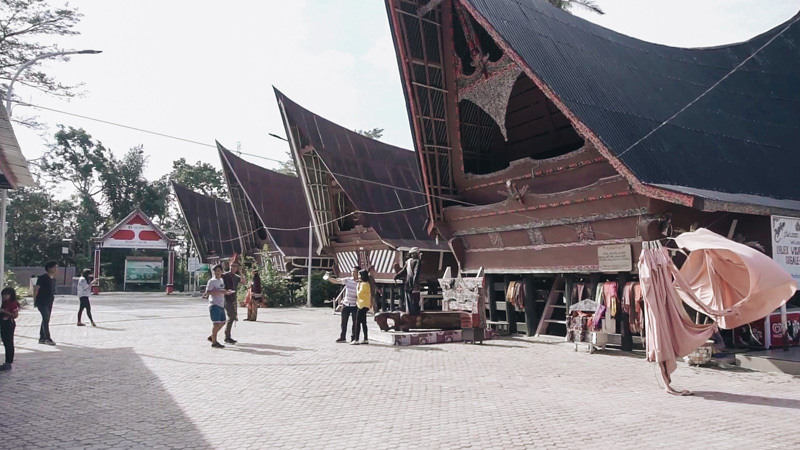 This is where all things big and small about the Batak culture can be found – don’t miss it for all things Batak! 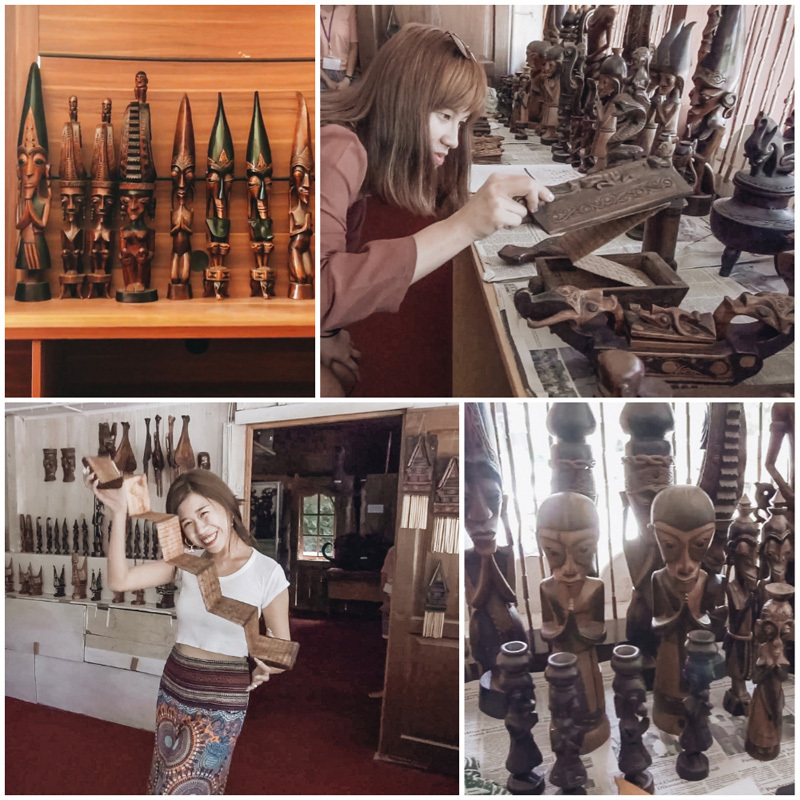 The museum is built to look like a traditional Batak house, with ancient weapons, traditional clothes and household items displayed inside it. 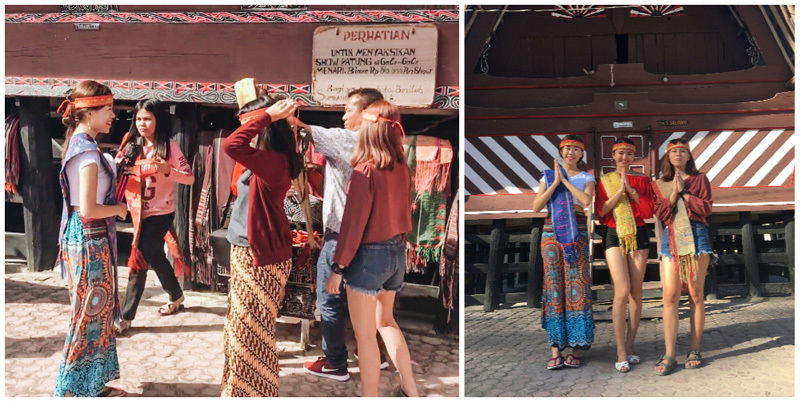 You can even get dressed in traditional Batak wear and snap a few pictures while you’re at it! When the Tripcanvas crew visited, a helpful guide followed us and tried to tell us more about the many artifacts. Unfortunately, the guides here only speak Indonesian, so unless you’re brushing up on your Bahasa Indonesia 101 before coming, you might have to rely on the English signs. There’s no entrance fee, but you’re encouraged to give a small donation, and why not contribute to this lovely museum that preserves a beautiful, fading heritage in the modern era? 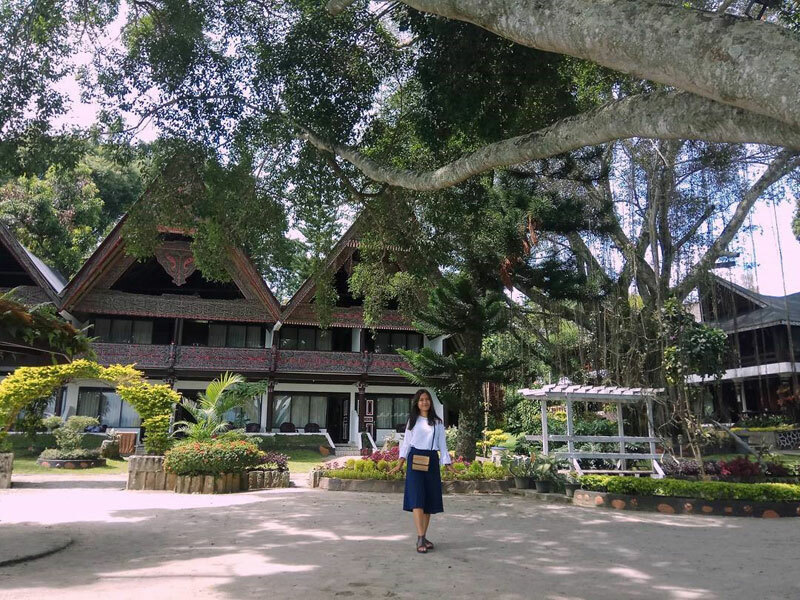 You might not be of Batak ancestry, but take a step in this traditional house, and you’ll feel what it was like to live in an era before modernisation. Address: Pulau Samosir, Sumatera Utara. Coordinates here. Getting there: Take the ferry or motorboat from Wisata Parapat Pier from 5am to 7pm (last boat). You can rent a private boat from Rp. 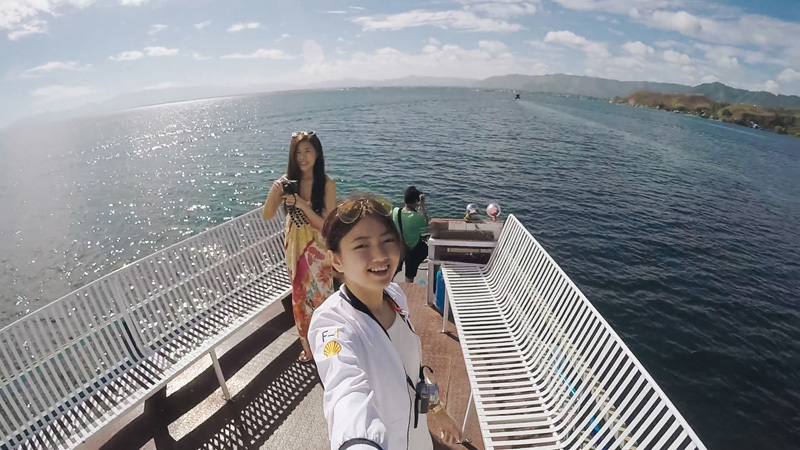 500,000 (approximately USD $3.38) for a return trip to Parapat Pier. This is what you’ve been waiting for, shopaholics. 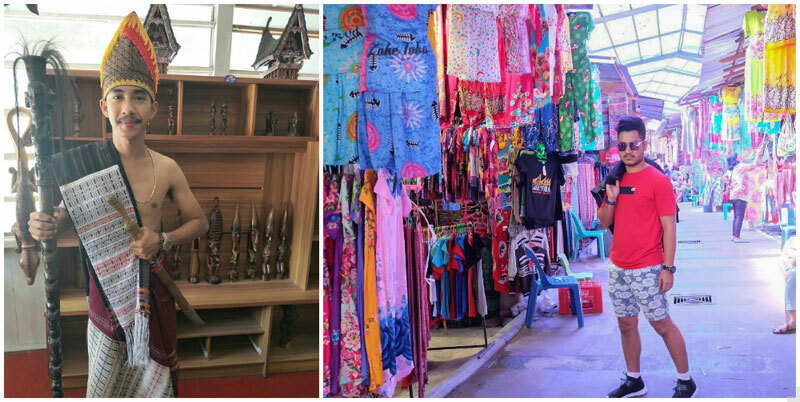 For the most authentic shopping experience in Lake Toba, Pasar Tomok is your market of choice. 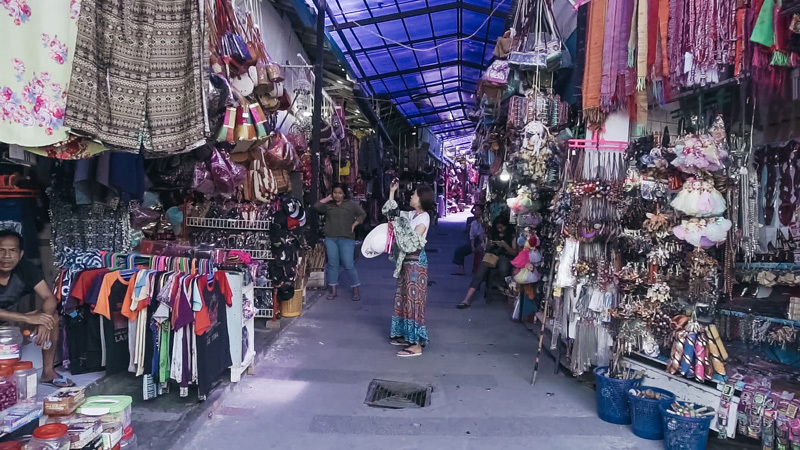 This bustling, no-frills street market might not be that air-conditioned mall that you know and love, but it comes with one thing we absolutely love: cheap prices. For low prices (that are still open to bargaining! ), you can get anything from bags and clothes to fruits and little trinkets. Time to stretch out that shopping bag! We don’t know about you, but in ancient days, this would probably be on par with being invited to Mark Zuckerberg’s mansion. 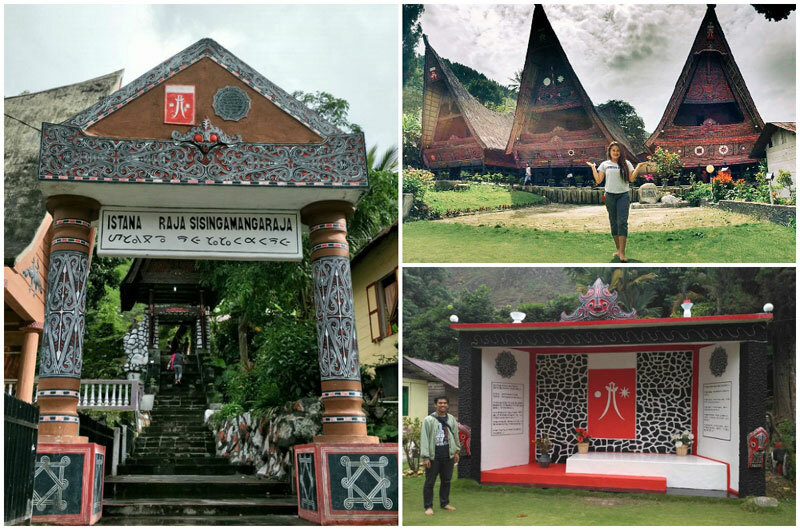 This museum at Samosir’s northern tip is one of the most special museums you’ll find. 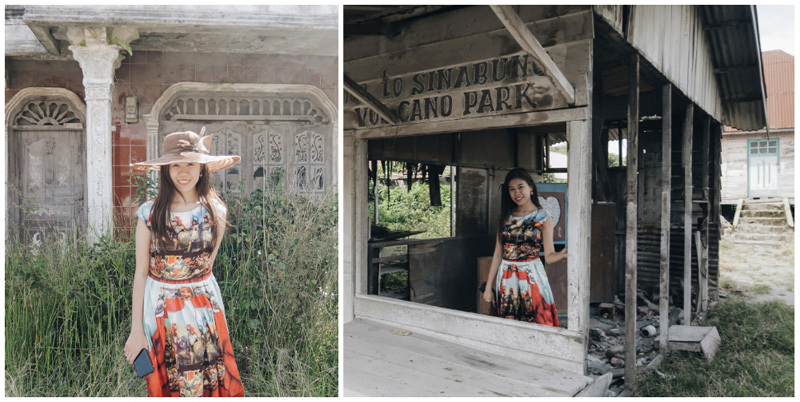 Featuring rows of traditional houses and a beautifully restored house that used to be home to a Batak king and his 14 wives, here’s where you can bask yourself in the unique vibes of historical Batak tradition. 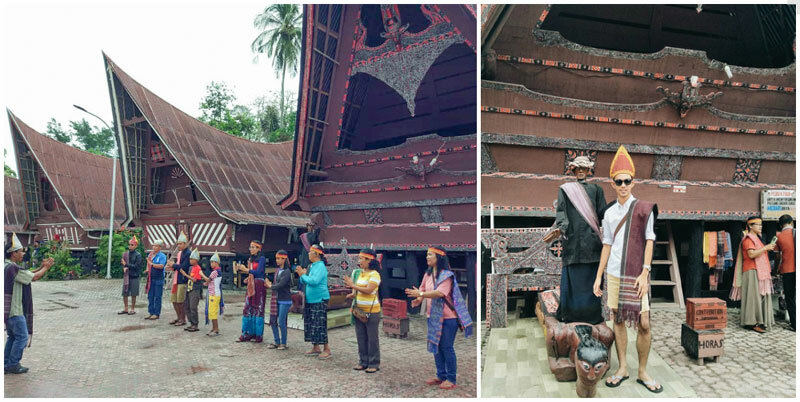 Traditional Batak dances are also performed daily here, and it’s a special experience you wouldn’t want to miss! While our team was there, the locals were even friendly enough to teach us how to dance! Pay for a museum and come out a master dancer? We’d say it’s super worth it. Note: Traditional Batak dance performances are held at 10:30am and 11:45am from Monday to Saturday, and 11:45am on Sunday, so time your visits well! 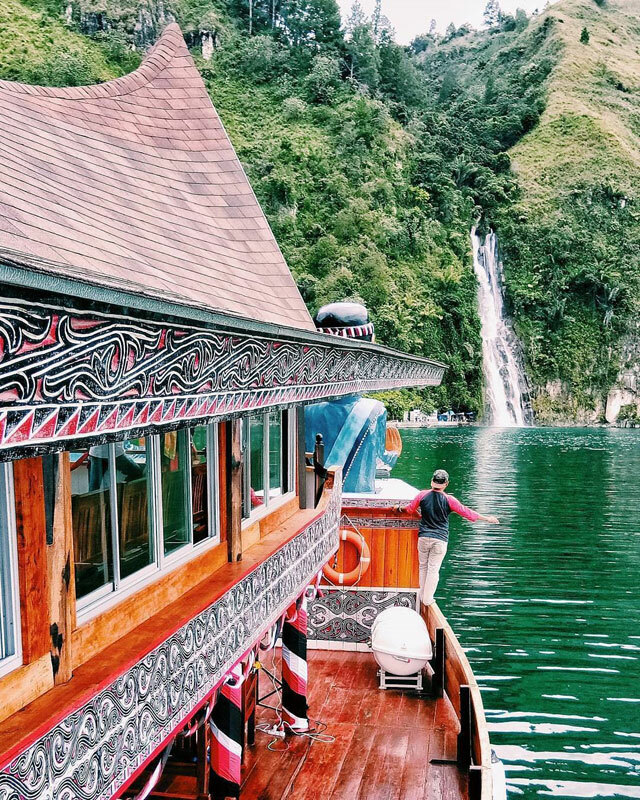 There’s no better way to experience Lake Toba than to experience living like the locals! 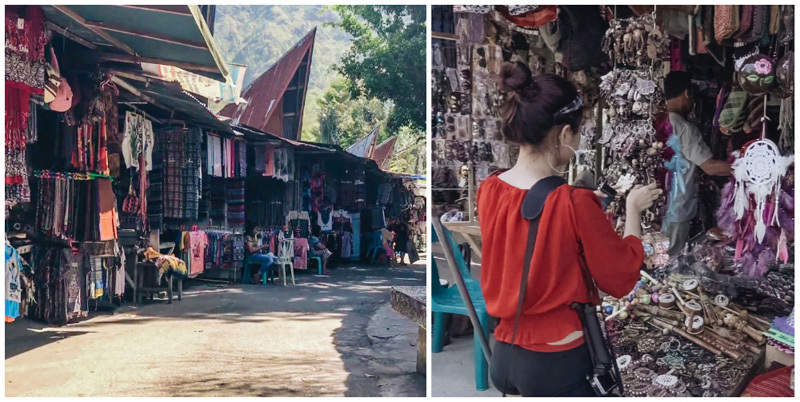 At Tuktuk Village, you can enjoy a quiet and affordable stay at a unique, traditionally designed hotels at affordable prices. It’s time to ditch the Wi-Fi, be the nature-loving hipster that was always in you, and reconnect with nature, simplicity and tradition. Even thrill-seeking adventurers can be promised tons of fun here, since you can also spend the day doing water activities such as canoeing, jet skiing, water biking or even fishing! Take a bite at the local food (halal food is readily available here) and play traditional games with the kids. Wake up to no alarms but the sound of birds chirping and the heat of the sun on your skin. 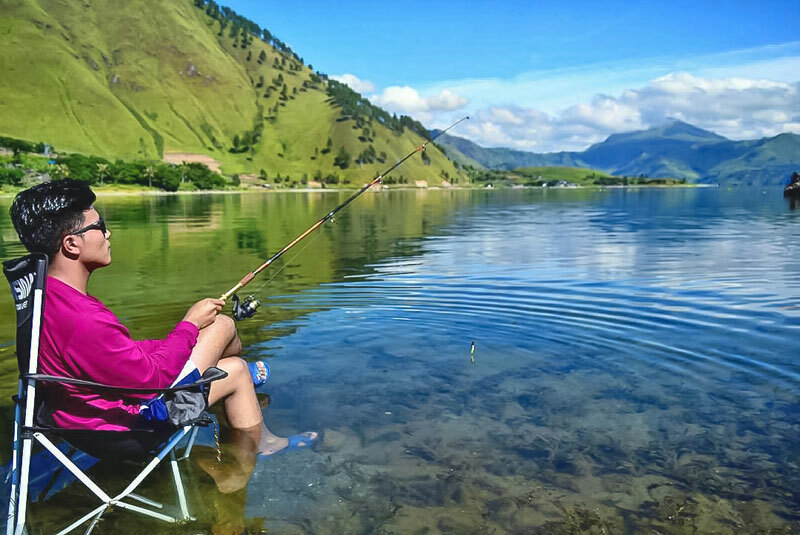 Life in Lake Toba might not be what it is in the city, but it’s never dull! Address: Simanindo District, Samosir Regency, North Sumatra. Coordinates here. This place is named Tanjung Unta, Indonesian for ‘camel’, because the shape of the island looks like the hump of a resting camel. True to its name, it’s definitely a great place to rest – if you’re adventurous enough, you can even camp here and roast some marshmallows under the stars. You can swim in the water, but watch out, for it can be rocky! And if you feel bored (we doubt it! ), there’s also a neighbouring beach called Batu Hoda, where you can get some good swimming and food checked off your list! Just remember to catch the sunset from Tanjung Unta before you leave – or you’ll definitely regret it! Address: Jalan St. H.H. 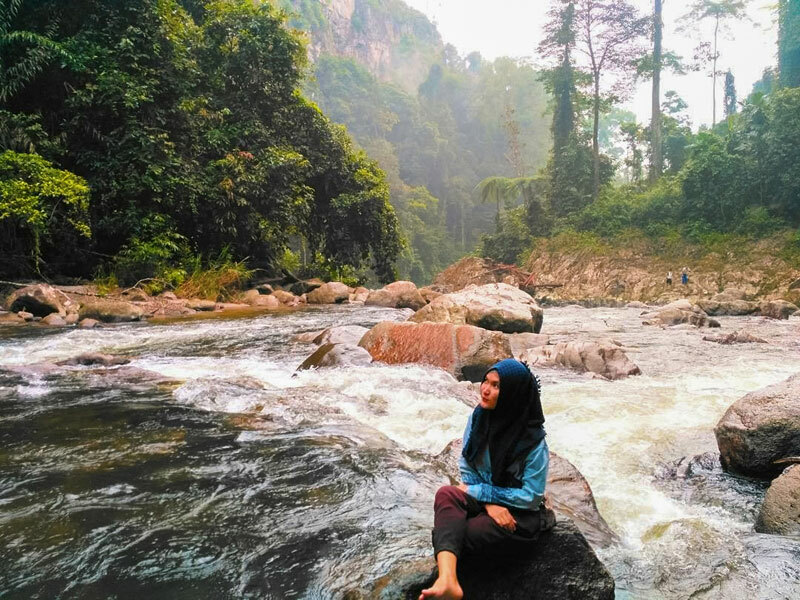 Damanik, Tambun Raya, Pamatang, Tigaras, Dolok Pardamean, Kabupaten Simalungun, Sumatera Utara 21186. Coordinates here. Getting there: You can take the bus or rent a car using the Medan-Pematang Siantar-Tanjung Unta route with a total distance of around 109 km. 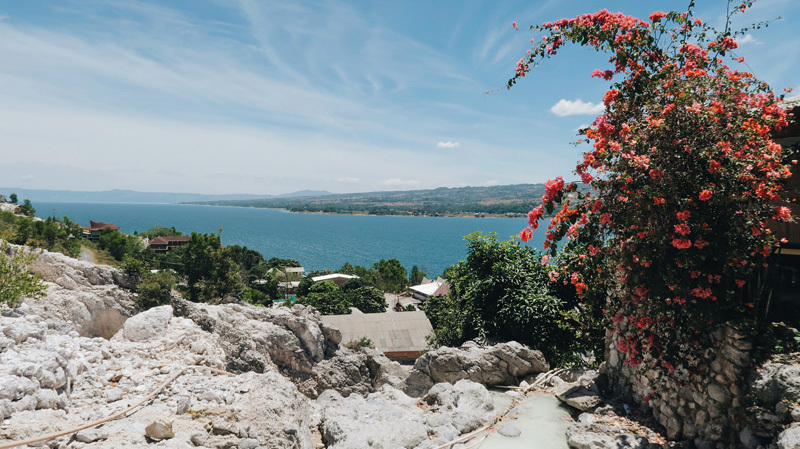 After a full day of exploring, why not take some time out to pamper yourself and indulge in Lake Toba’s natural hot spring? The water here contains thermal sulphur, which comes directly from the mountain! There’s also a man-made hot spring here, and those of you who like it real hot will probably prefer tthis – we experienced the springs ourselves, and the natural spring was significantly less warm (less than 40°C). And if you get the hunger pangs while relaxing in the hot tub, don’t worry, for there are a few local shops there selling some tidbits. All you have to bring is your tired body, a pack of extra clothes, a camera, and maybe your GPS – the place may be a little hard to find, but hey, aren’t all gems like this? Address: Rianiate Village, Pusuk Buhit Slope, North Sumatra. Coordinates here. Getting There: If you’re walking from Pangururan, it will take around 45 minutes to 1 hour because of the winding roads. You can go on a family trip to many places, but what can be better than a fun day out with your loved ones in a place with fresh air and endless greenery? This place is definitely a must-go for families on holiday – just ask the tons of tourists who’ve already been here! Originally a missionary school, this place is often used for retreats, prayers or simple family activities. But don’t be fooled by how unassuming it looks – this recreational area is unique for its natural Gibeon waterfall, which falls into a man-made pool. 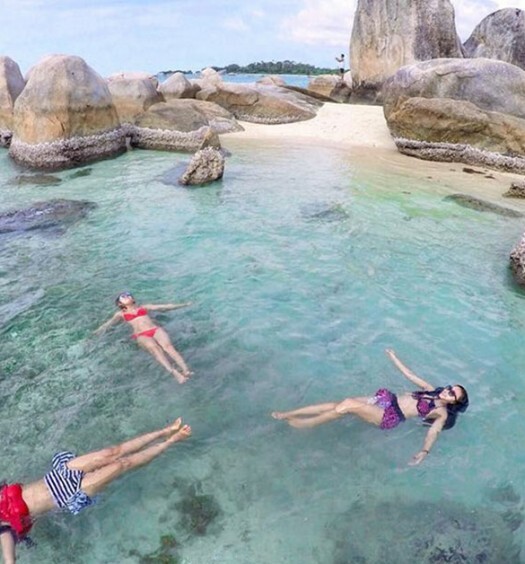 Where else can you get relaxing soak that also comes with a pretty awe-inspiring view? 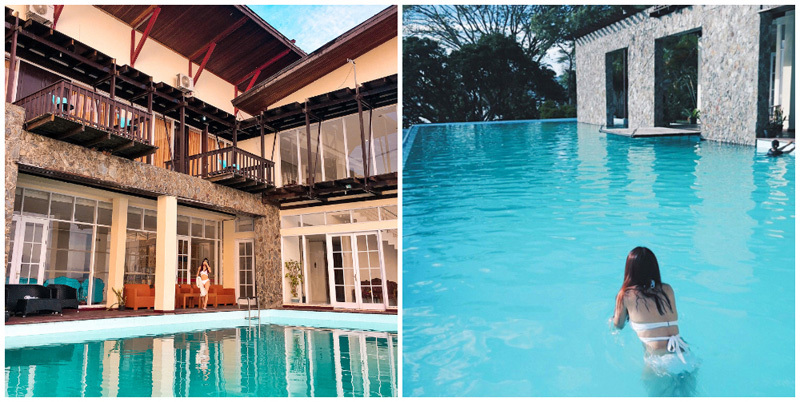 Besides that, there are also a number of different pools in the premise that offer cooling soaks to soothe your aches, and mountainous greenery to soothe your sight! With a view like this, you can almost pretend your kids aren’t screaming in your ear. 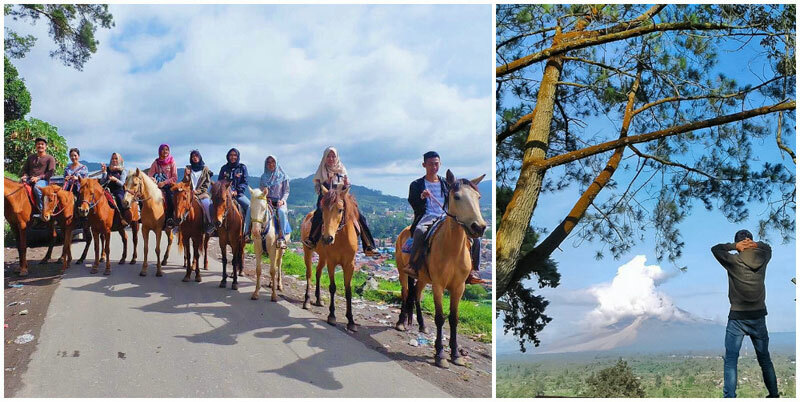 The Sibuatan Mountain is the highest mountain in North Sumatra, with a height of 2457 metres above sea level. To get to the peak, you’ll have to go through 3 valleys, 3 hills and also a moss forest – so at least your eyes will be getting pampered while your body suffers! 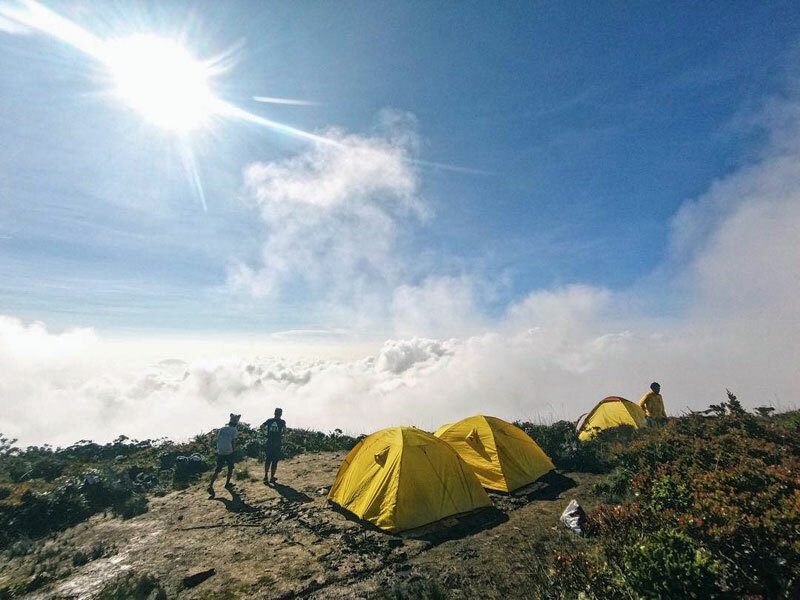 Considering how high the mountain is, some people choose to set up camp halfway through, which also gives them time to hike both of the mountain’s peaks, one in the east and one in the west. One of the peaks even has a large black stone called ‘Makumba’, providing a vastly different view from the other! 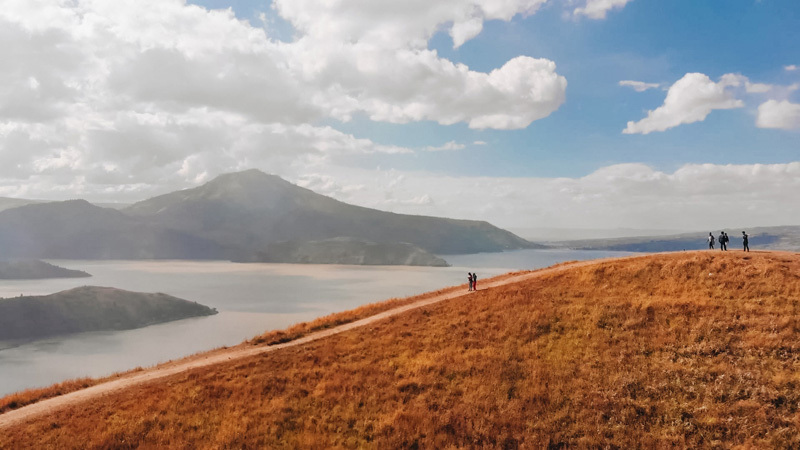 If you have the time (and fitness) to spare, we’d definitely suggest that you climb both peaks – what’s one stunning view when you can have two different ones, right? Address: Kecamatan Merek, Kabupaten Karo, Sumatera Utara. Coordinates here. Getting there: From Medan, you can head to Naga Lingga town, Kecamatan Merek. 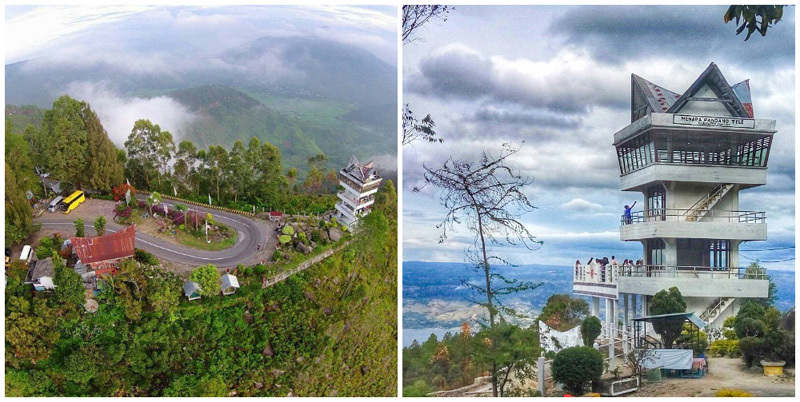 It takes around 3 hours to reach Naga Lingga from Medan by car. 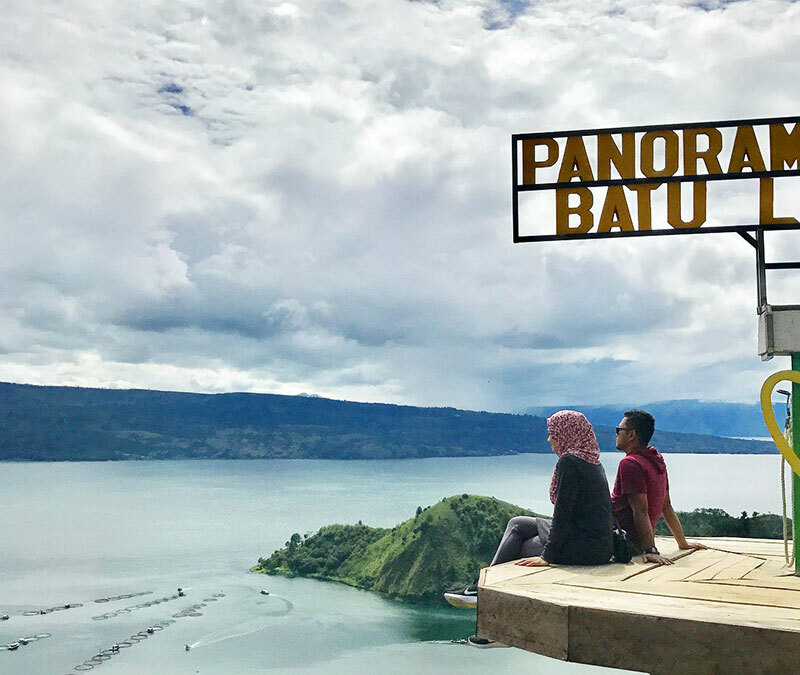 With a couple of unique photo-friendly platforms overlooking Lake Toba, Bukit Indah has become one of the most sought-after photo destinations in the area. 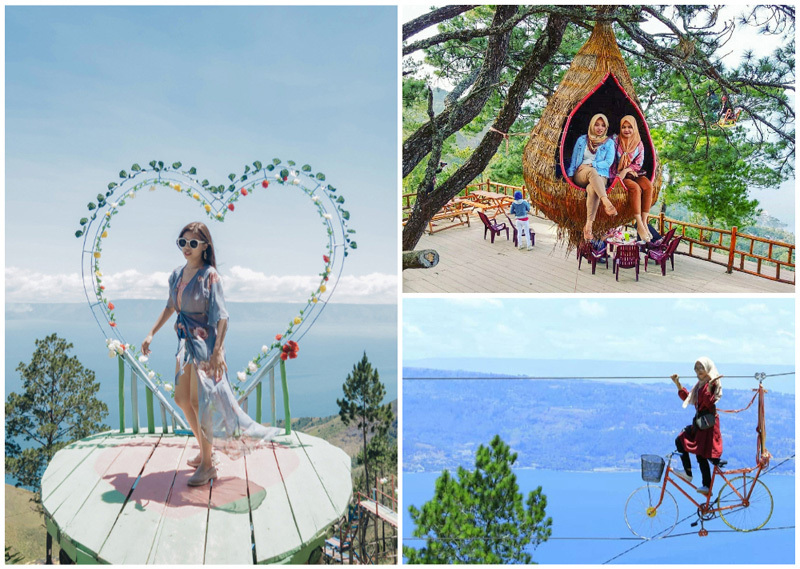 Snap your Instagrammable shots on a hot air balloon platform, or on a giant palm or heart suspended above the scenic beauty in the skies. Or, scream like a pirate on the deck of a ship, and make your coolest pose on a motorbike against a backdrop of the ocean. 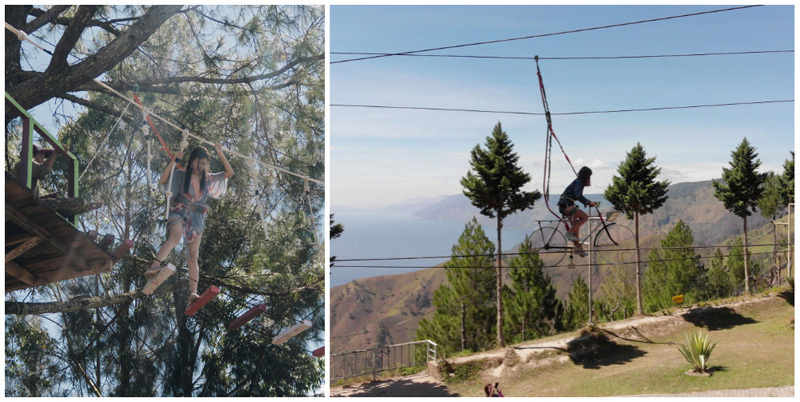 If you’re brave enough, you can even take a treehouse swing into the clouds! 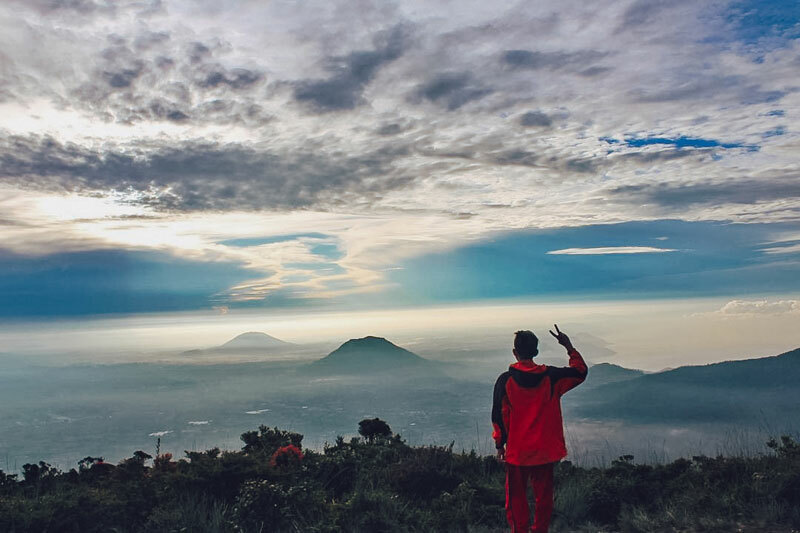 The best times to visit Bukit Indah are in the mornings and evenings, when you’ll have great lighting for photography and a chance to watch the sunset over the lake. Keep in mind that it is cooler up there, and the weather changes quickly, so remember to bring a jacket! Price/Entrance Fees: From Rp. 5,000 (approximately USD $0.38) for 5 minutes of photography, Rp. 10,000 (Approximately USD $0.68) for parking. Address: Jl. Simarjarunjung, Parik Sabungan, Dolok Pardamean, Kabupaten Simalungun, Sumatera Utara. Coordinates here. 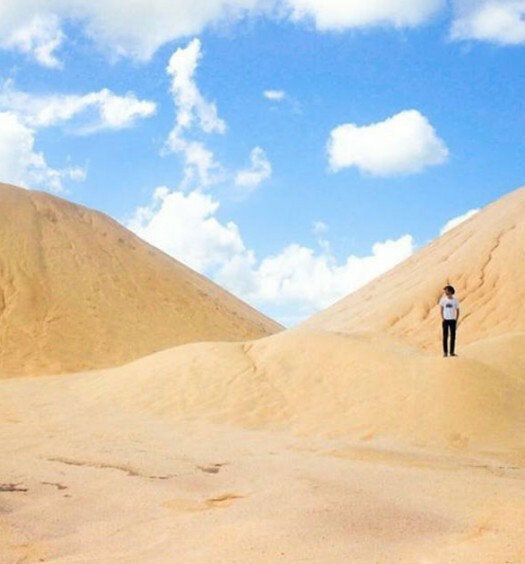 This isn’t your ordinary beach. 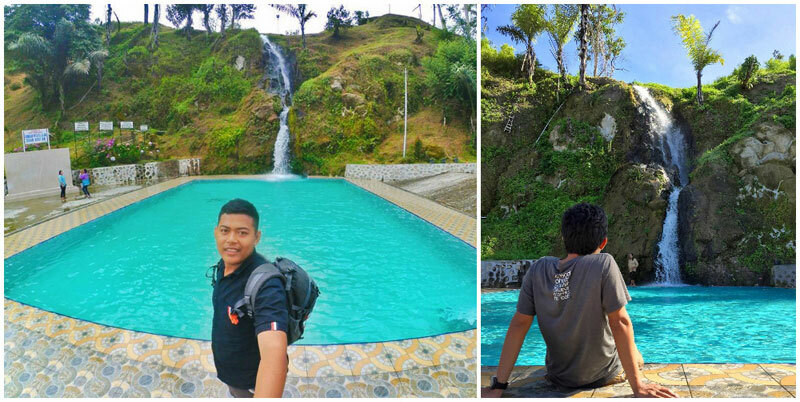 Bukit Paropo is where the grassy green hillsides meet the many shades of sparkling blue of the waters below. 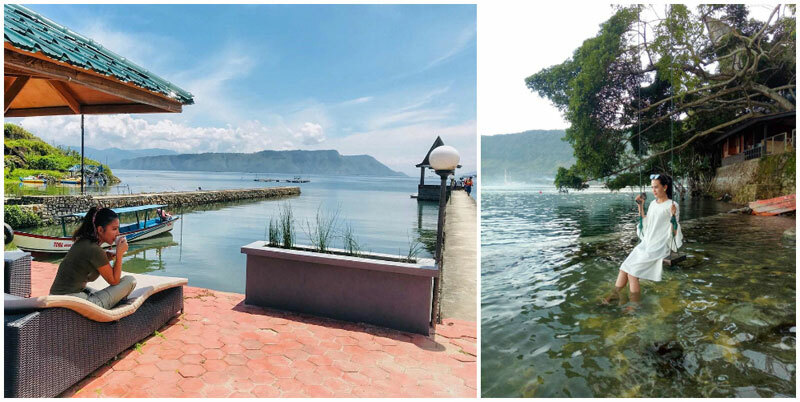 Rather than salty seawater, Bukit Paropo “beach” faces the beauty of freshwater Lake Toba. 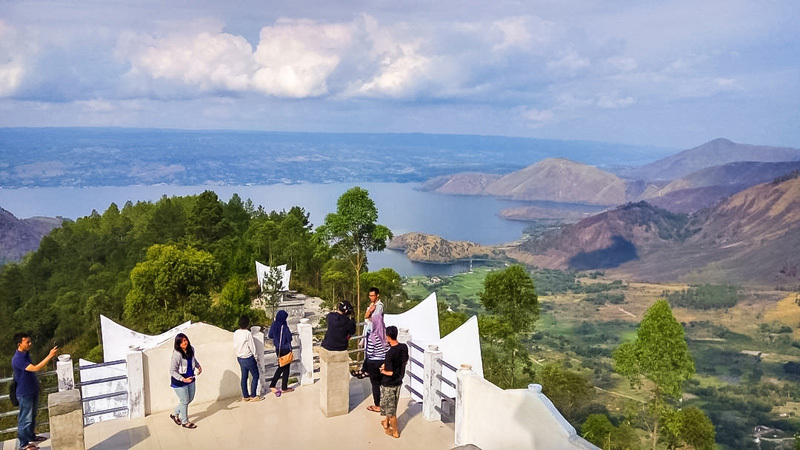 Though Bukit Paropo is becoming increasingly popular among local tourists, you have around 28 kilometres of “beach” to enjoy. So find your own spot, and you’ll soon feel as though you own the place! With such majestic natural beauty all around you, isn’t this a slice of heaven? Getting there: From Medan, travel to Paropo Hill via Sibolangit, Berastagi, Kabanjahe, and enter Dairi County. When you arrive at Dolok Tolong area, you will find a T-junction. Turn left and continue to Tao Silalahi. 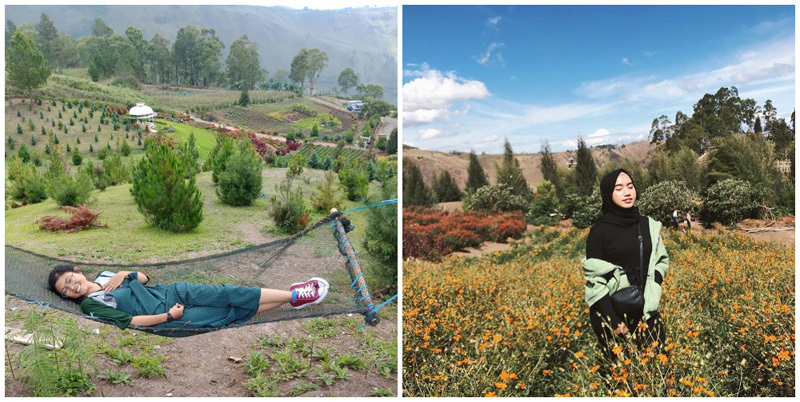 There are few things better than a morning in the mountains where you can breathe in the fresh mountain air, and Berastagi’s Bukit Gundaling is no exception. 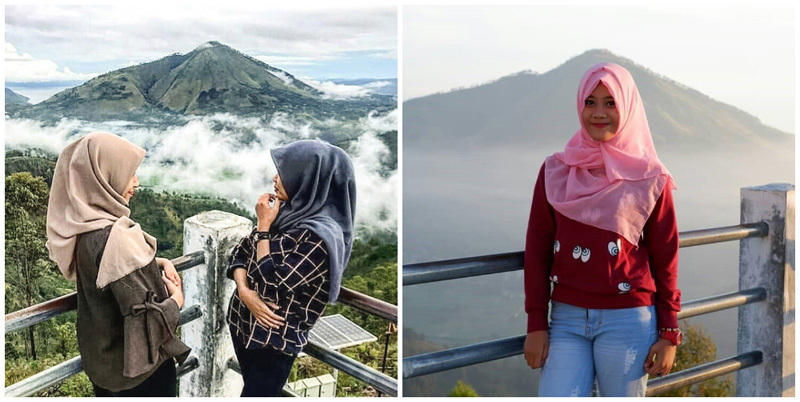 From the peak of Bukit Gundaling, you can set your eyes on two of Sumatra’s most stunning volcanoes – Sibayak and Sinabung. If you’re planning a trip there in the afternoon, remember to stay for the sunset and watch the sky transform its light and colour in a spectacular display. Feel like doing something more active? How about horseback riding around the Gundaling area? 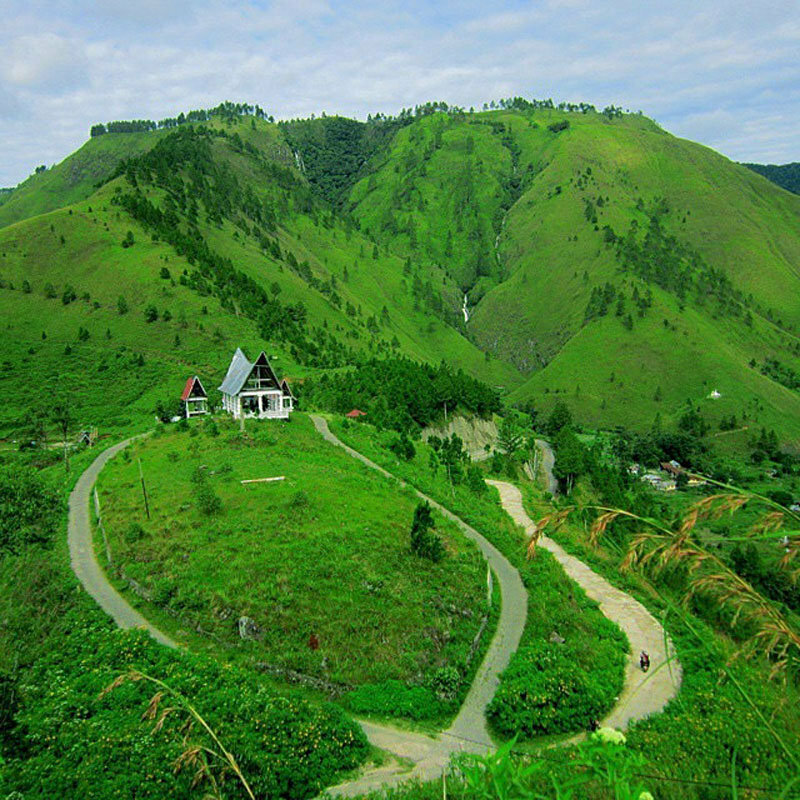 Getting there: Gundaling Hill is located about 3 km from Berastagi city. From the roundabout of Berastagi city, exit to Gundaling Street and follow the road to Gundaling Hill. 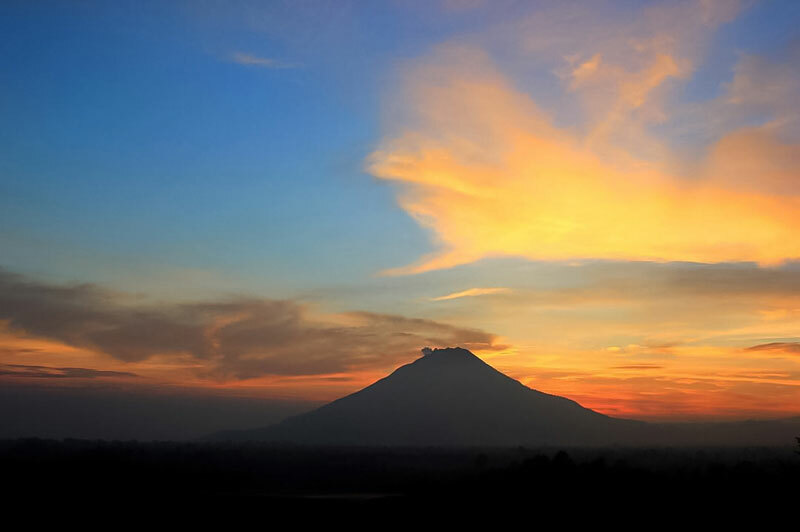 Pusuk Buhit is a volcano that is located in Northern Sumatra. However, it’s not known for frightening explosions, but for a gorgeous view – rolling green hills that go on forever. Batak legend has it that the first Batak man, the Batak King, was born on Pusuk Buhit. Even now, many Batak descendants still scale the mountain in order to garner blessings from him. If you’re fit and up for some exercise, why not try hiking up the summit? There are multiple routes to take in order to scale this volcano, and none of them are too strenuous, although it might take you seven or eight hours to reach the top. 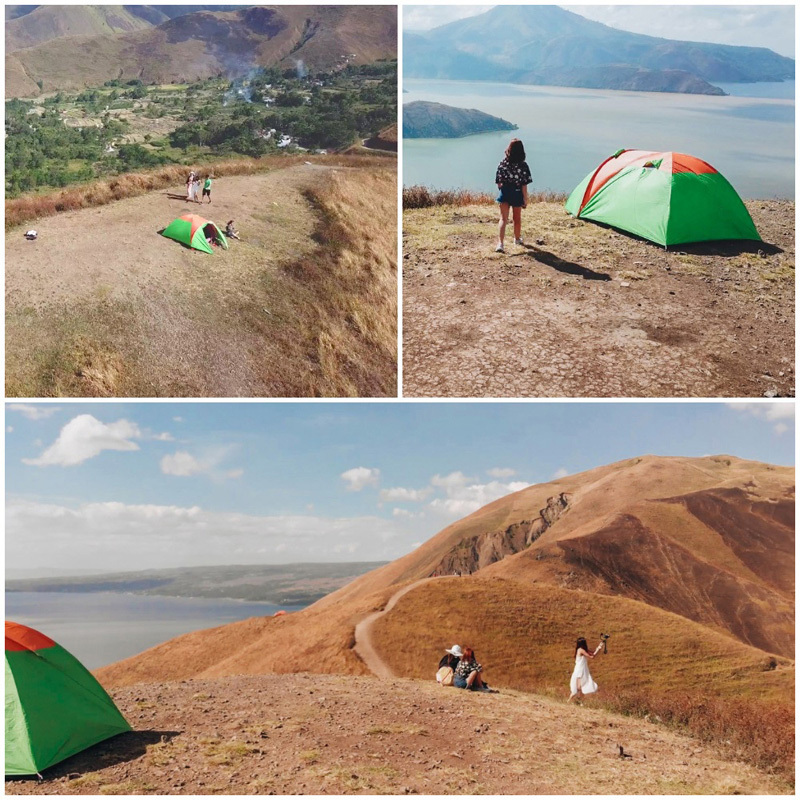 But hey, you’ll be hiking amongst striking grassland and the best of nature, and you’ll even be awarded with extraordinary view of the sunset if you time your hike right. If you ask us, all the blood, sweat and tears will be worth it in the end. Getting there: Pusuk Buhit is located near Pangururan, west of Samosir island, an hour’s ferry ride away from Tuk Tuk. You can arrive at the starting point by taking the ferry from Medan. – Get to Pandu Hotel of Prapat as they have their own standard ferry, with adequate number of life vests. You need to charter the whole ferry and it starts from Rp 700,000 (approximately USD 50) during the normal season. 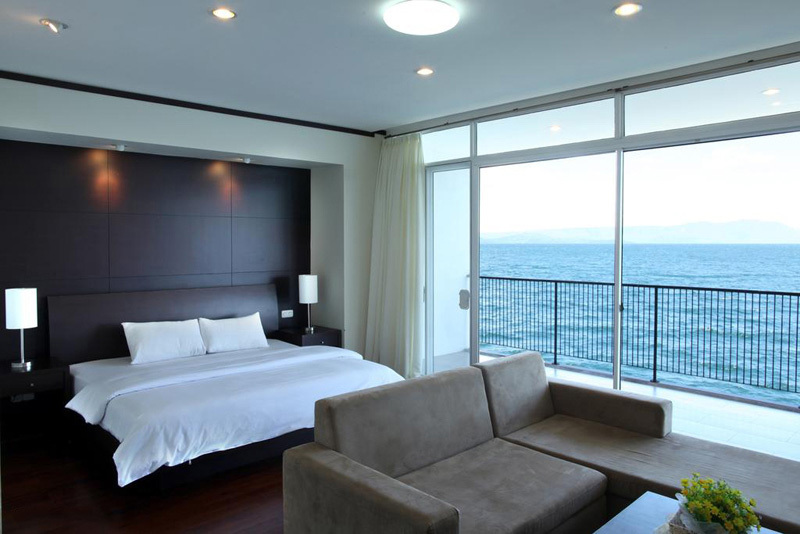 It is well-maintained, and they often work with travel agent for foreign group bookings. So if you are coming in a huge group of 15-20 people, this is a value-for-money and safe option. – Around the area with main hotels, there are ferry services that are in better condition and are slightly more expensive (Rp.25,000 per person, approximately USD 1.80) than the ones docking in the main harbour near the market. – Look for signs of big winds before boarding, as most ferries (besides the ones we mentioned above) are wooden ferries that are not very stable. The wind tends to pick up around 3-4pm onwards. – You get what you pay for. Our writer took a wooden boat that costs Rp.15,000 per person (approximately USD 1), and the boat was very rundown. Due to the cheap price, they kept delaying and trying to load more people on board. – Assess the ferry’s appearance. If it looks new, sturdy and reliable, even if it is more costly, go for it. 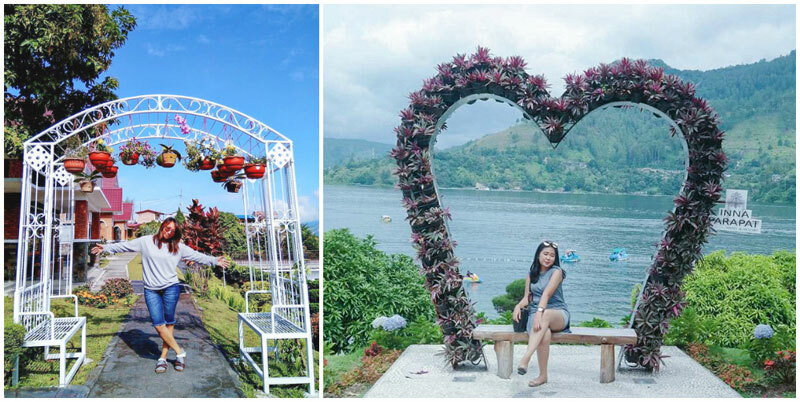 So do you believe us now when we say there’s plenty to do in Lake Toba? But what are words and pictures compared to actual sight? 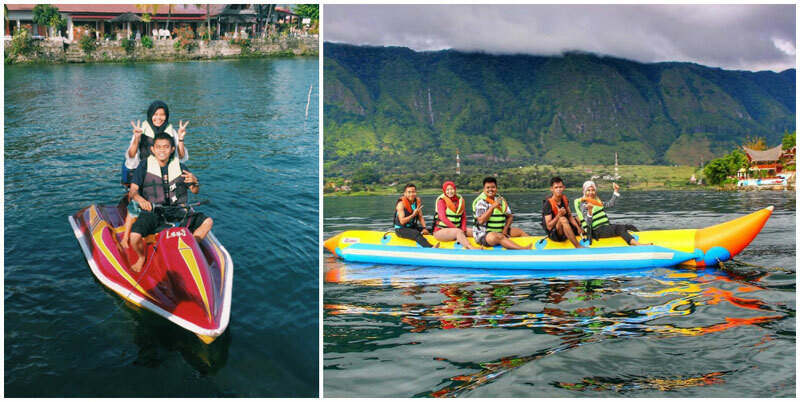 Call up your adventurous friends and head here to discover Lake Toba this holiday! Take a flight to Medan (Kualanamu Airport) via Jetstar. It will take you around 1 hour 25 minutes, and starts from around SGD 105 (approximately USD 76). Take a flight from Kuala Lumpur International Airport to Medan via AirAsia. (Return flights from RM 165) It will take you around 1 hour. The flight to Medan city takes about 2 hours 30 minutes, and starts from Rp. 1,447,411 (approximately USD 109) via Lion Air for a return trip. You will land at Kualanamu Airport in Medan. From here, you can continue the journey by taxi, DAMRI bus or train. Train schedule here. Currently, Medan is the only city in Indonesia whose airport is connected by train. 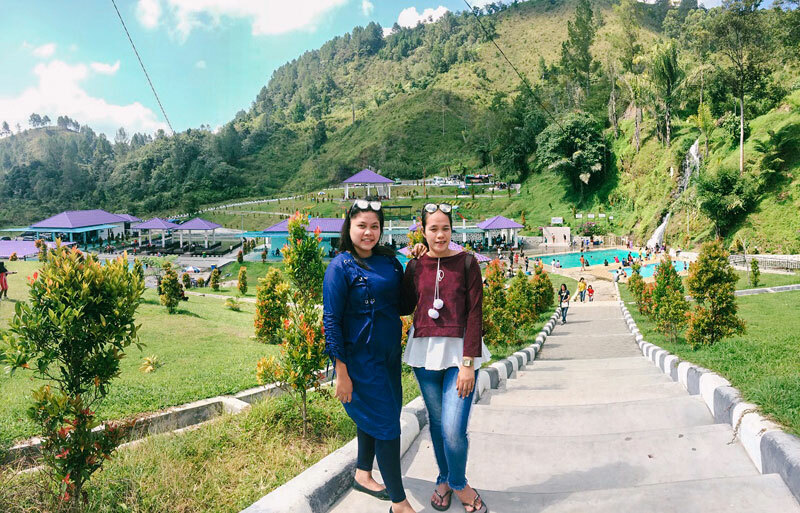 For a more affordable option, you can opt for mini vans that are available in the airport that will directly take you to Parapat, the town by Lake Toba. It will only cost you Rp. 80,000++ (approximately S$7.60 or MYR22.60) as you have to share the van with 7 other passengers, and the van will only depart after all seats are taken up. Reviewed for their excellent service and reliability, Yoga Rent a Car Medan offers car rental services with various transportation options and ideal for 3 to 12 people! All their vehicles below are insured and are in good condition! Hire a driver or driver with guide to get around the island privately and enjoyably while you relax in the comfort of your vehicle and get to know about your surroundings with insights from the knowledgeable guide! *Note: Prices differ based on the number of people travelling (type of car required) and tour itinerary. If you prefer freedom, flexibility and travelling at your own pace, you might want to consider self-driving car rental services from Yoga Rent a Car Medan itself. Tip: If you are unfamiliar with Indonesia’s roads and traffic, we strongly recommend you to rent a car with driver instead, as the road conditions might be challenging to navigate, and fellow drivers might not be easy to deal with! 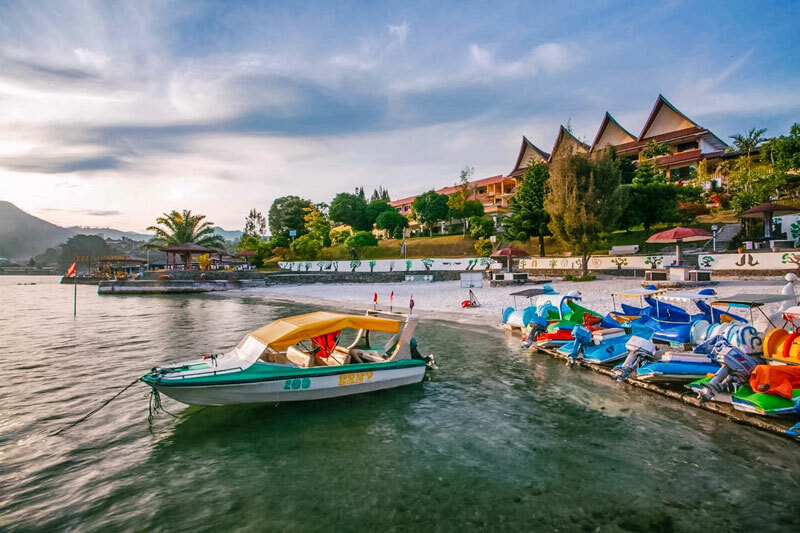 To enter Tuk Tuk, Samosir Island (the main tourism area of Lake Toba), you’ll have to catch a ferry from Ajibata Harbour in Parapat to Tomok Harbour in Tuk Tuk. The trip will cost you Rp. 8,000 per person (approximately S$0.80 or MYR2.30) but remember to double check the prices to avoid scams. If you are renting a car, you can also ship your transportation all the way to Tuk Tuk (include drivers and passengers) at only Rp. 91,500 (approximately S$8.70 or MYR26). Important note: Please be reminded that the above departure time is subject to change! On Samosir Island, we recommend you to rent a bicycle or motorbike (Rp.100,000 a day) to explore the island. Both are available on the island and do be cautious as the road safety here isn’t at its best. 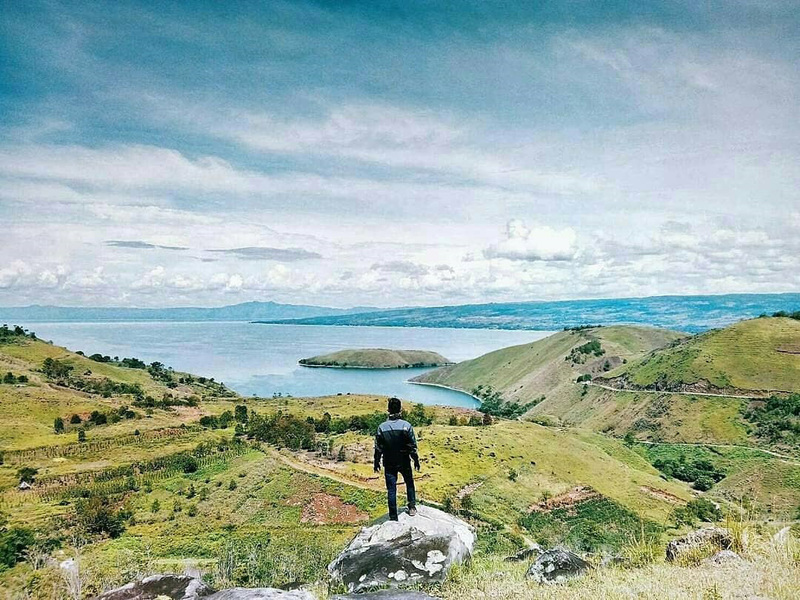 To enjoy the beauty of Lake Toba at its fullest, we recommend you to travel here during their dry season which occurs between May to September. During this period, you can explore clearer blue skies and sunny weather. Unless you want to spend your holiday stuck in the hotel due to the unceasing rain or use an umbrella as your photo accessory, avoid the rainy season from November to late March. Public holidays such as Eid holidays or Chinese New Year are not ideal for travelling here too because everything from the crowd to the prices will go up.